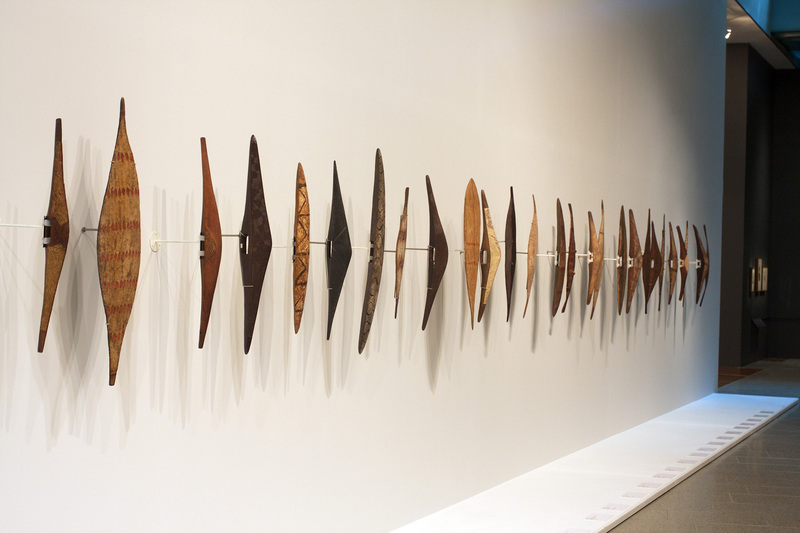 Presented in conjunction with the exhibition Colony: Frontier Wars (15 March – 2 September 2018) which presents a powerful response to colonisation through a range of historical and contemporary works by Indigenous and non-Indigenous artists dating from pre-contact times to present day. Warning: Aboriginal and Torres Strait Islander readers should be aware that this posting contains images and names of people who may have since passed away. 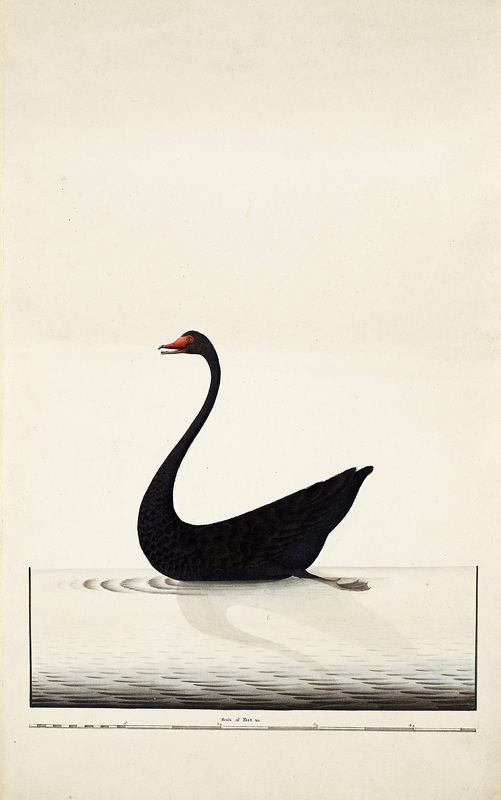 This is an ambitious double exhibition from the National Gallery of Victoria: historical with a contemporary response. 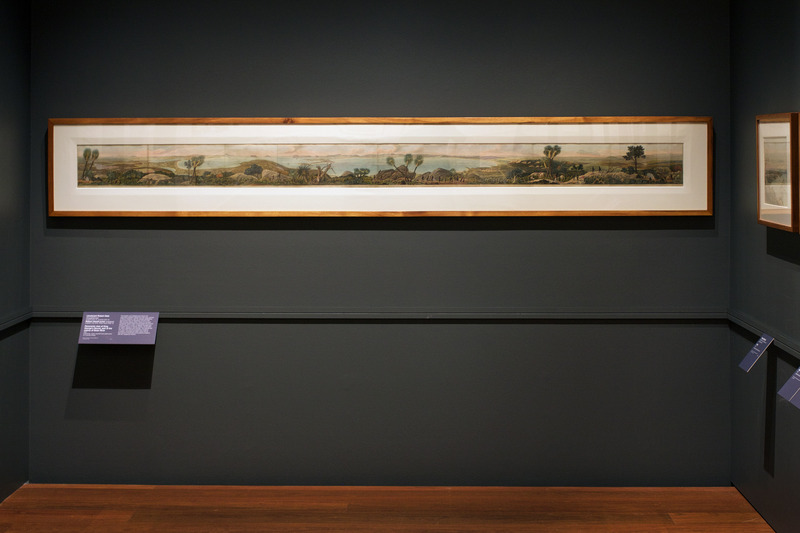 I didn’t have time to take installation photographs of the contemporary exhibition on Level 3 during the media call, concentrating instead on Colony: Australia 1770 – 1861, the historical exhibition on the ground floor of NGV Australia at Federation Square, Melbourne. 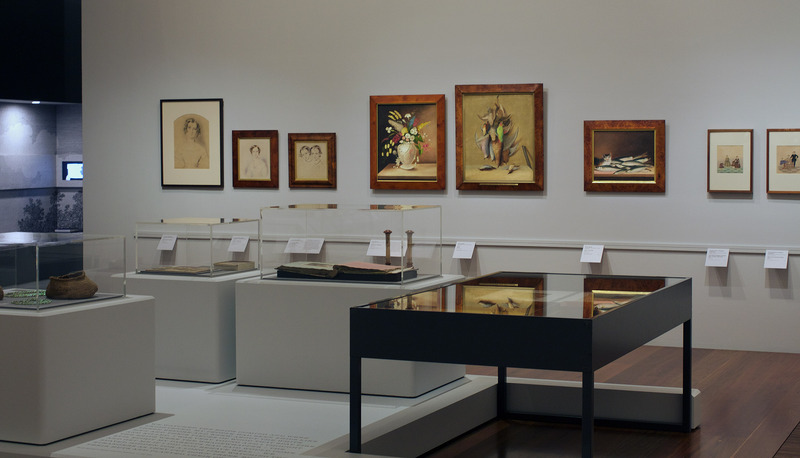 A review, along with the installation photographs of the many early photographs present in the exhibition, will be presented in Part 2 of the posting. 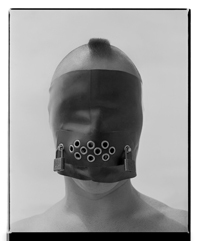 Suffice to say that his exhibition should not be missed by any Australian. 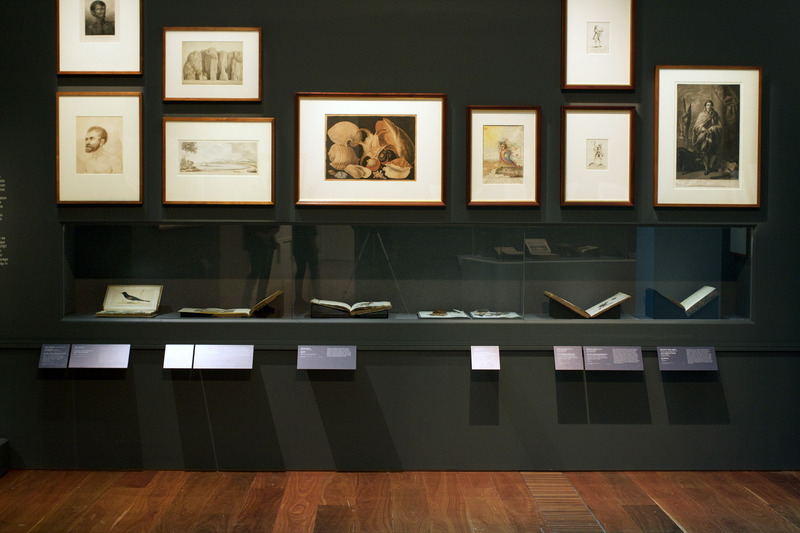 Many thankx to the National Gallery of Victoria for allowing me to publish the photographs in the posting. Please click on the photographs for a larger version of the image. 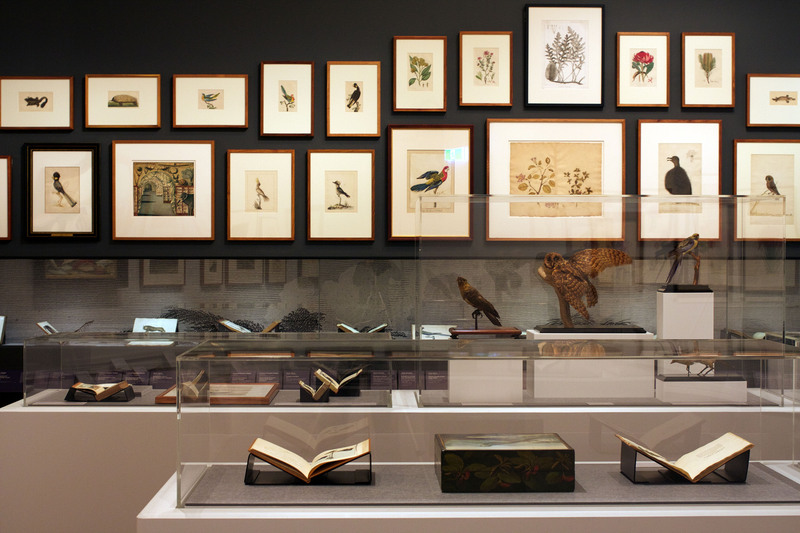 All installation photographs © Dr Marcus Bunyan and the National Gallery of Victoria. 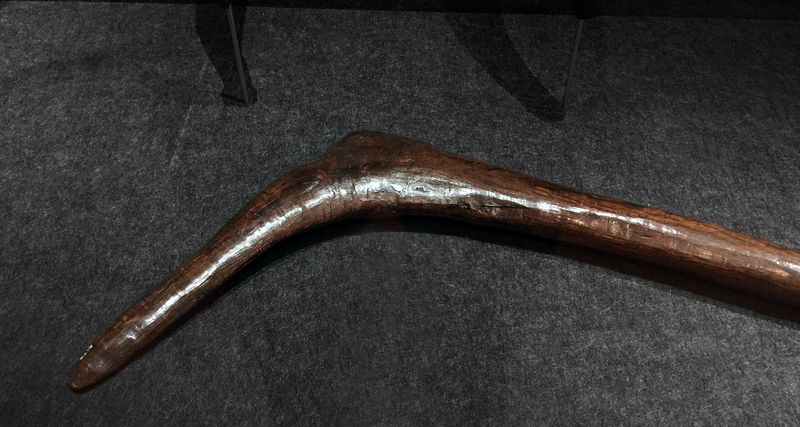 91.3 x 19.5 x 9.5 cm irreg. 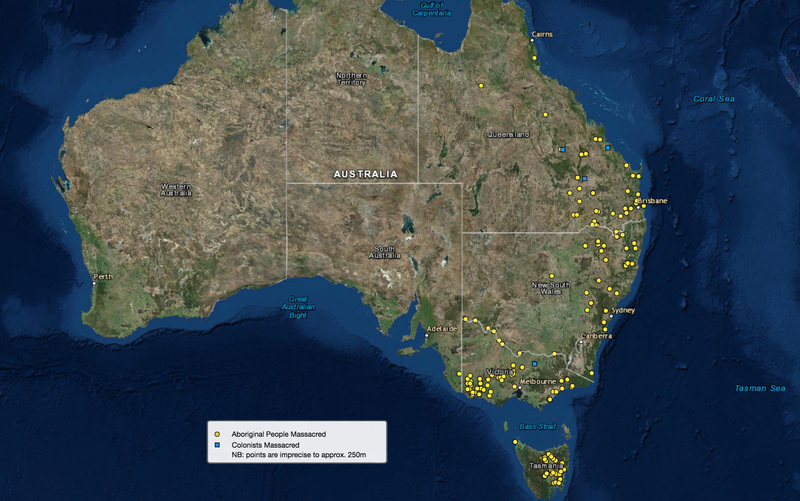 Aboriginal people have occupied the Australian continent for more than 65,000 years. 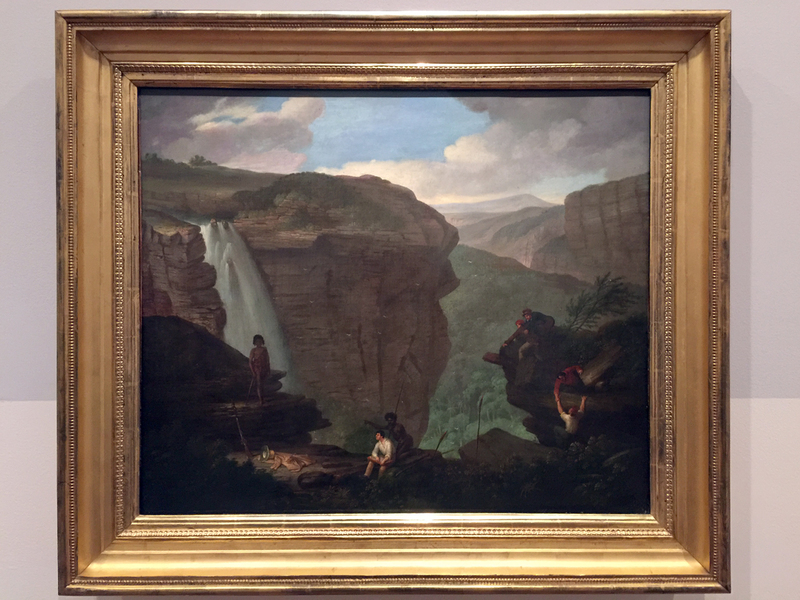 The arrival and settlement of Europeans, from 1788, affected them profoundly. 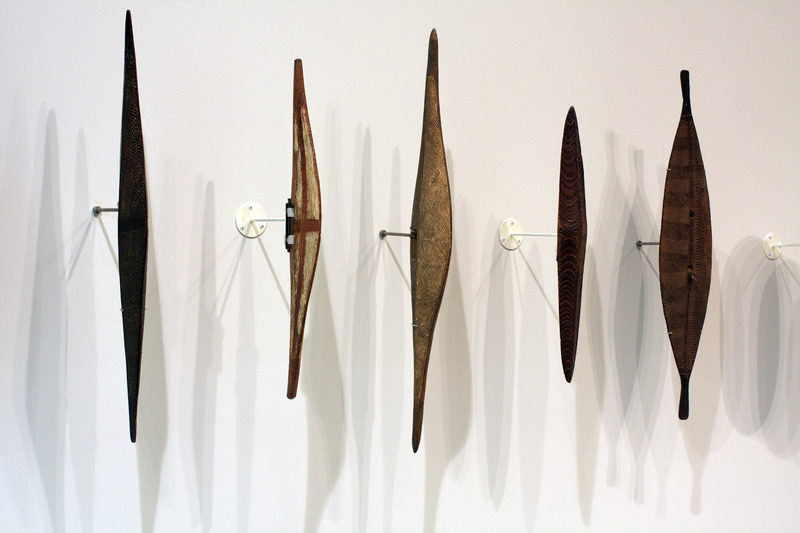 This proud massing of nineteenth-century shields at the entrance to this exhibition serves as both a reminder of the resilience of Aboriginal people in the face of colonisation, and a representation of the first chapter in Australian art. 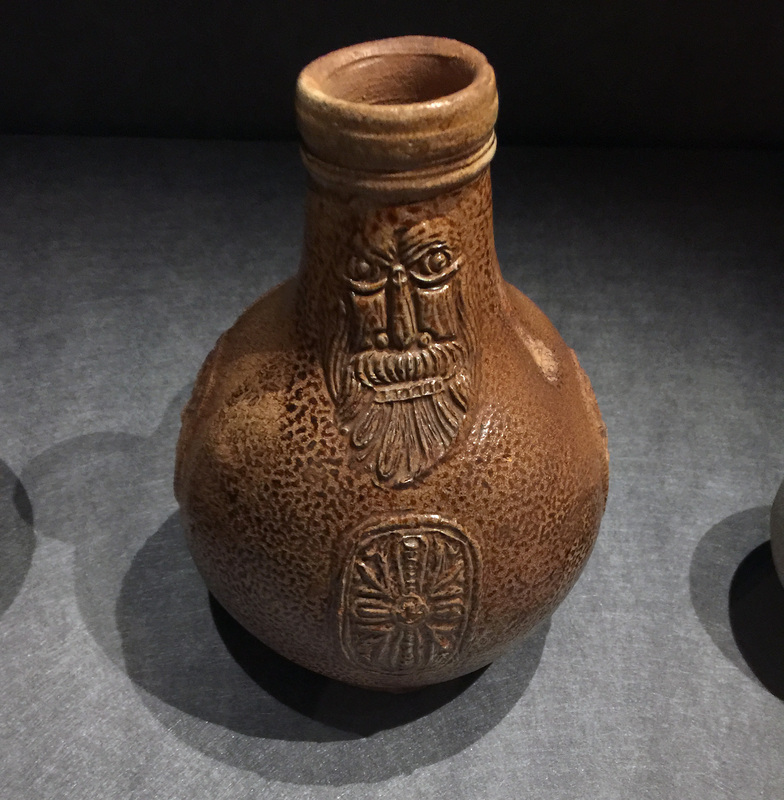 The painted and incised designs on the shields are signifiers of the identities and places of these artists whose names, language groups and precise locations were not recorded by European collectors. 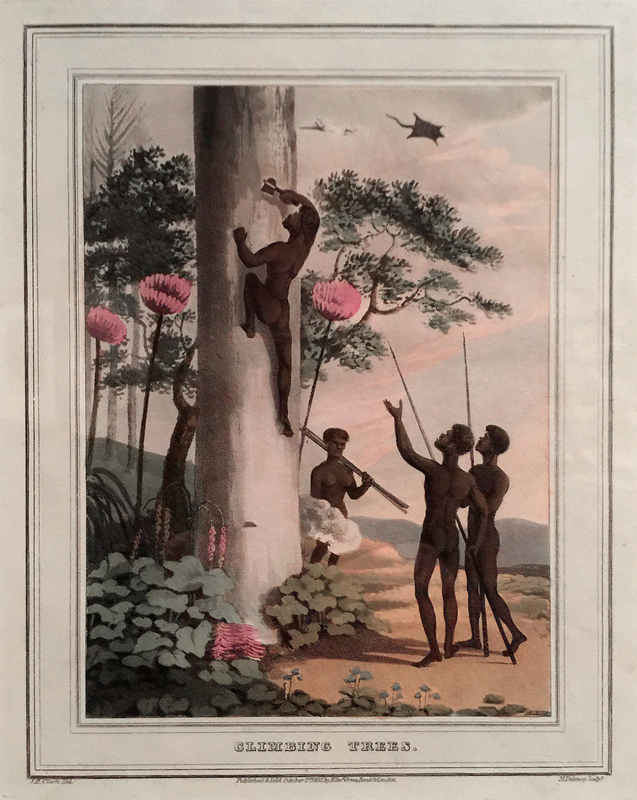 The notion that James Cook ‘discovered’ Australia denies the presence of Aboriginal people for 65,000 years and overlooks other European and regional visitors to the Australian coast. 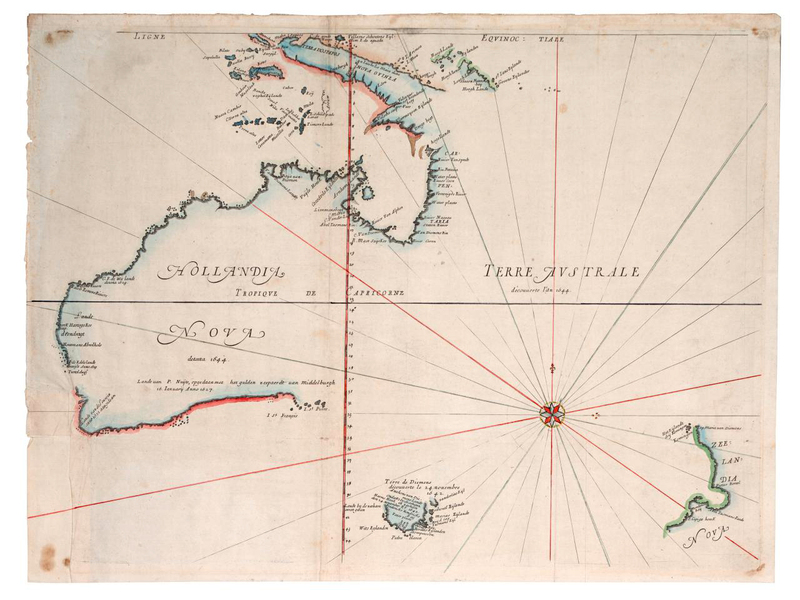 The existence of a great southern land, Terra Australis, had long exercised Europeans’ imaginings about the world and began to take a more realistic shape on maps in the early seventeenth century because of maritime exploration. 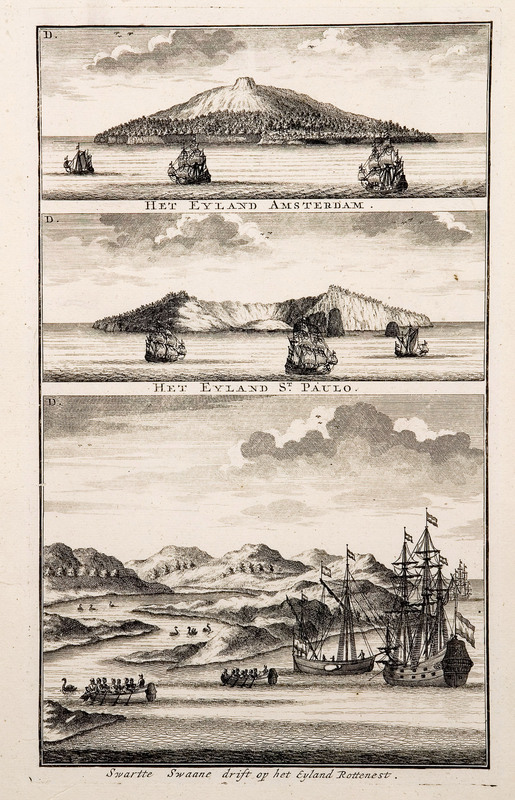 The earliest documented European contact was that of Willem Janszoon and his crew aboard the Dutch ship Duyken, which landed on the west coast of Cape York Peninsula in 1606. 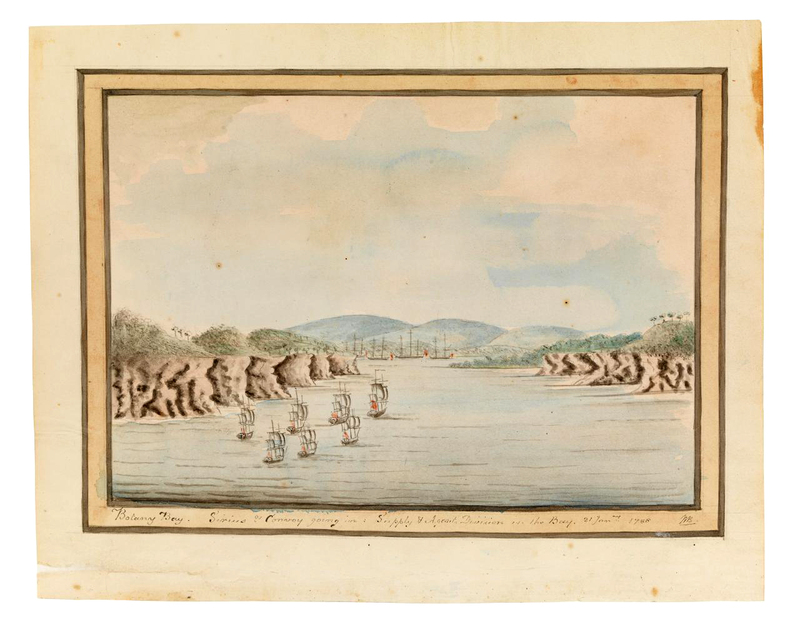 Although Botany Bay had been chosen as the site for the establishment of the new penal colony, within days of arriving in January 1788, Governor Arthur Phillip relocated the First Fleet north to Sydney Cove in Port Jackson. Here the ships could be safely anchored and a freshwater stream provided a crucial water supply around which the first rudimentary settlement of tents, huts and the governor’s residence was established. The early years were extremely difficult and the colony faced starvation as the crops failed due to the lack of skilled farmers, unfamiliar climate and poor soil. But as farming pushed into more arable lands during the 1790s, settlement expanded and new townships were laid out, competing for resources with the Aboriginal inhabitants and dispossessing them of their lands. 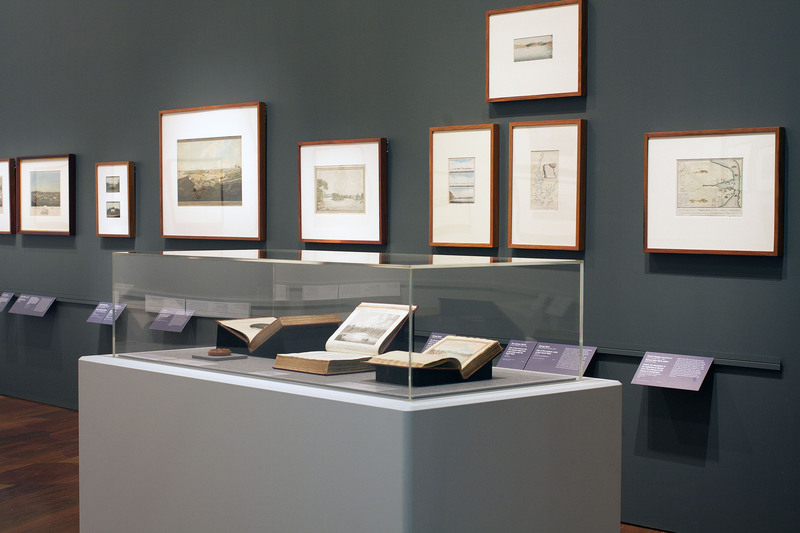 Installation view of the exhibition Colony: Australia 1770 – 1861 at NGV Australia at Federation Square, Melbourne with at left lower, George Tobin’s Native Hut (or Wigwam) of Adventure Bay, Van Diemans [Diemen’s] Land 1792 folio 16 in his Sketches on H.M.S. 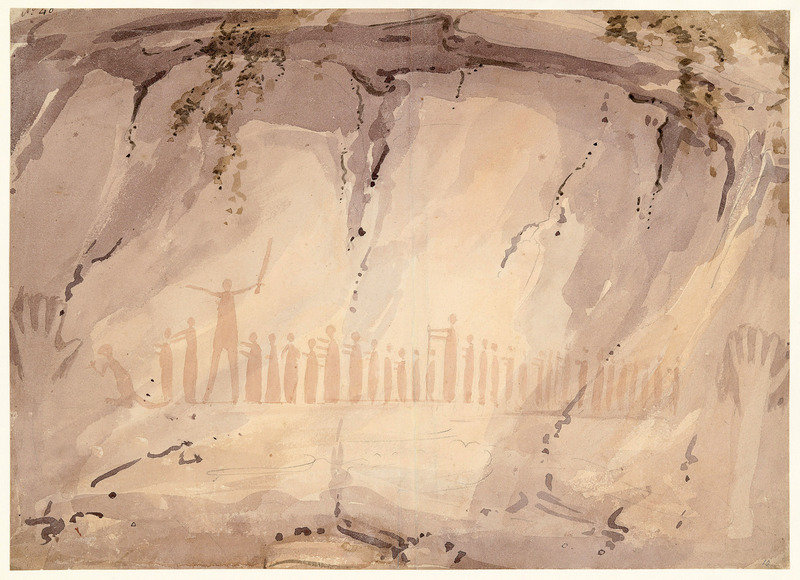 Providence; including some sketches from later voyages on Thetis and Princess Charlotte album 1791-1831 watercolour. 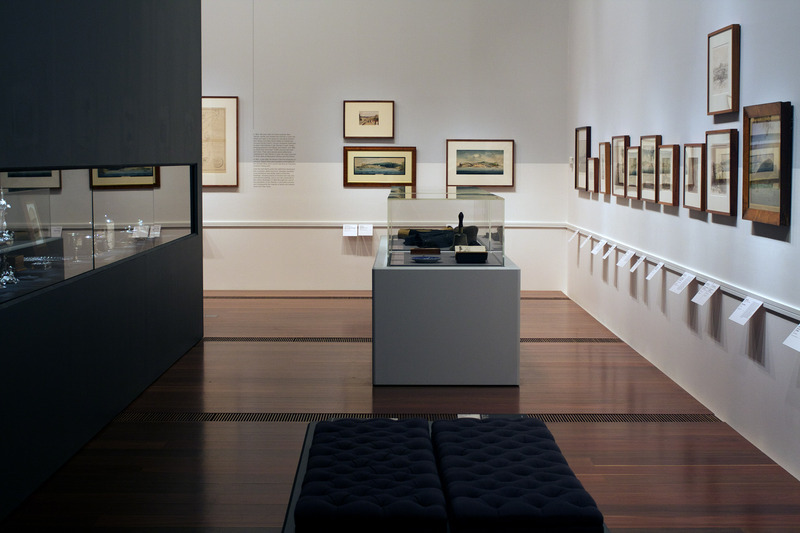 State Library of New South Wales, Sydney Acquired from Truslove and Hanson, in 1915 – in the image below at bottom left. 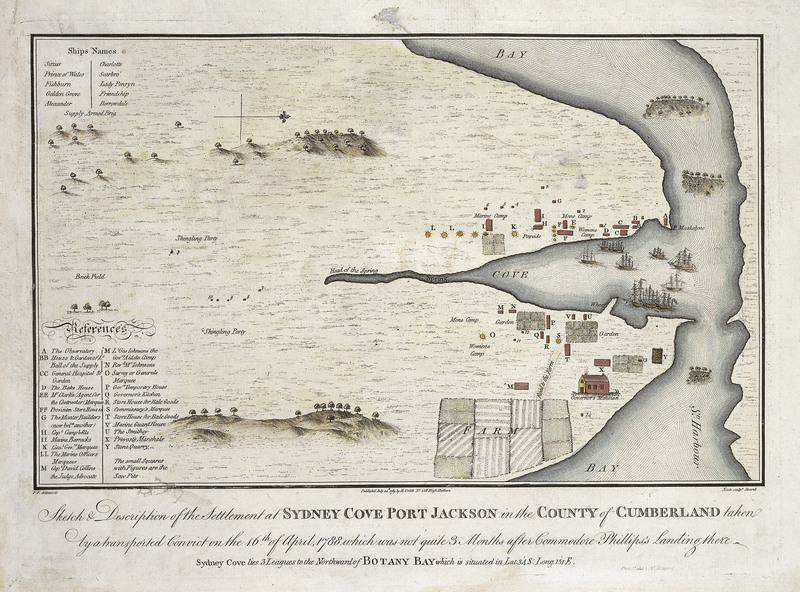 The favourable accounts of New South Wales by James Cook and Joseph Banks were influential in the government’s selection of Botany Bay as the site for a new penal colony. 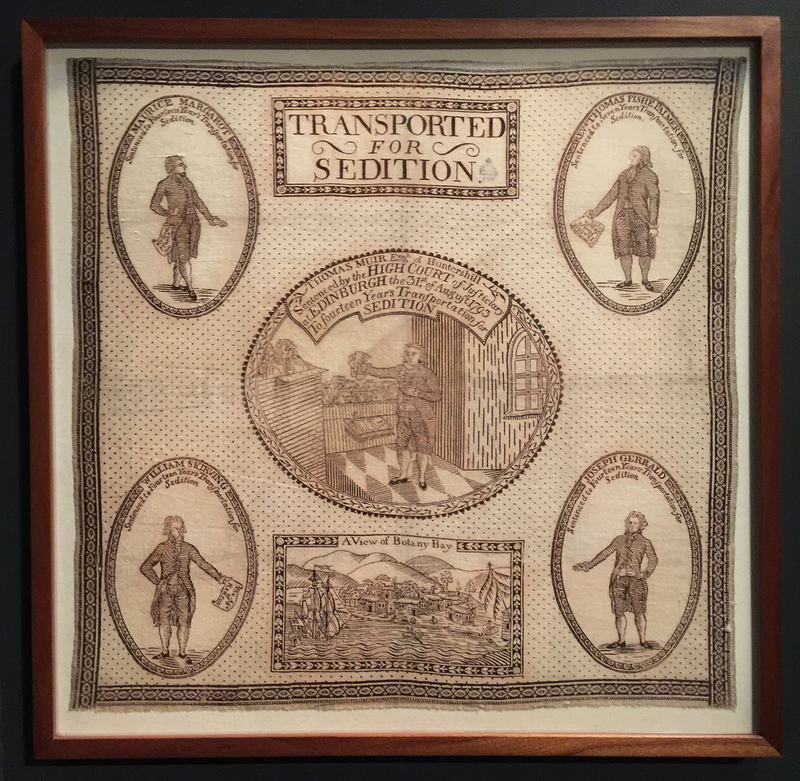 Britain’s loss of the American colonies in 1783 ended convict transportation across the Atlantic and increased the pressure for new solutions to the rising rates of crime and incarceration experienced in late eighteenth-century Britain. 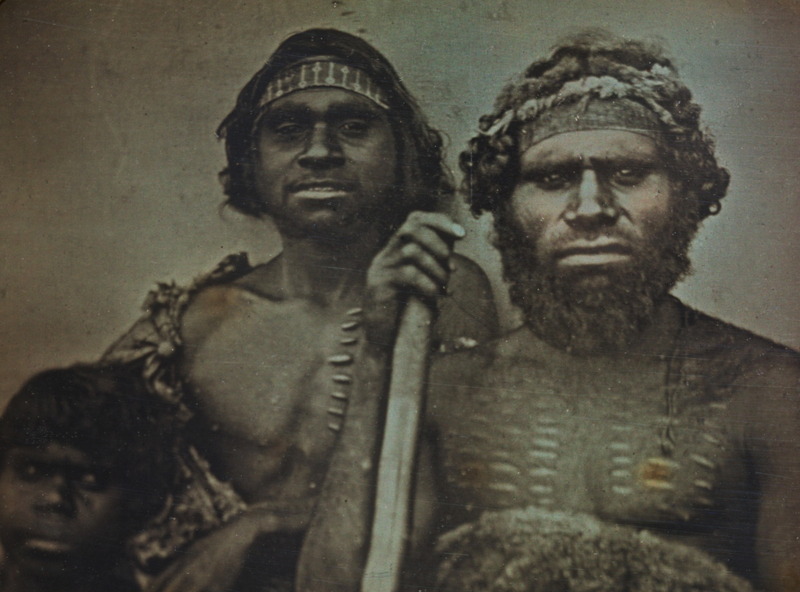 The founding of a penal settlement in New South Wales was perceived not only as providing a solution to domestic, social and political problems but also as holding the key to territorial expansion in the South Pacific and the promotion of imperial trade. 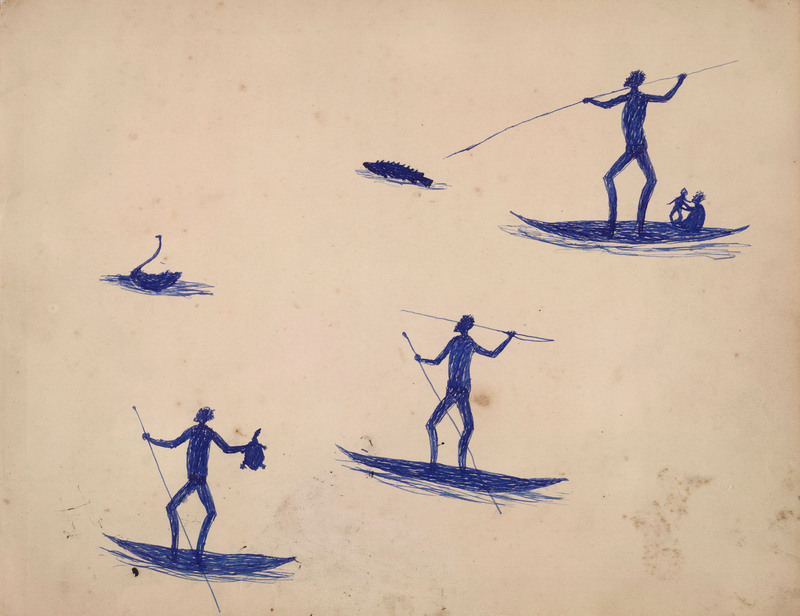 In the early years of settlement there was little contact with the Eora, the Traditional Owners of the area around Sydney Cove, who actively avoided the new arrivals, but as the colony grew, communication, and occasionally friendships, developed. 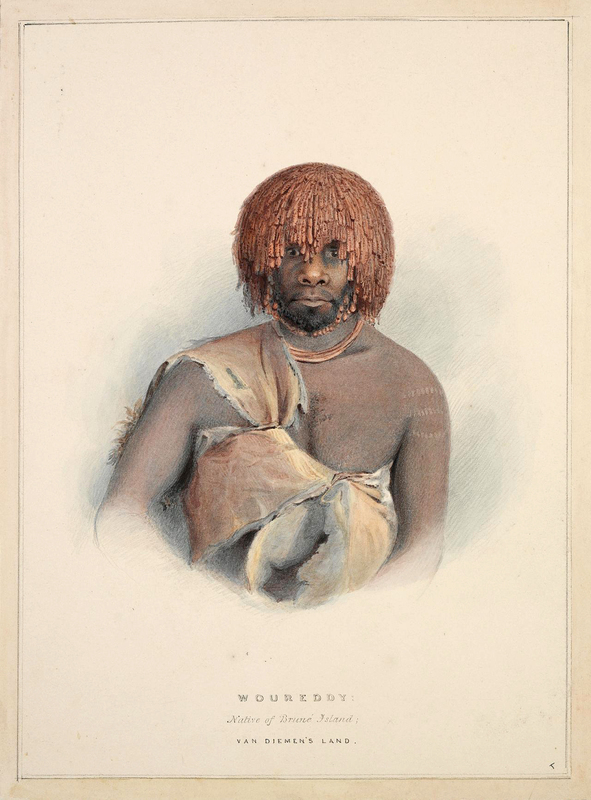 The English had little understanding of the deep relationship between the Eora and their lands, and their careful management of resources, which were soon overstretched by the colonists. Famine and introduced diseases also devastated numerous communities. 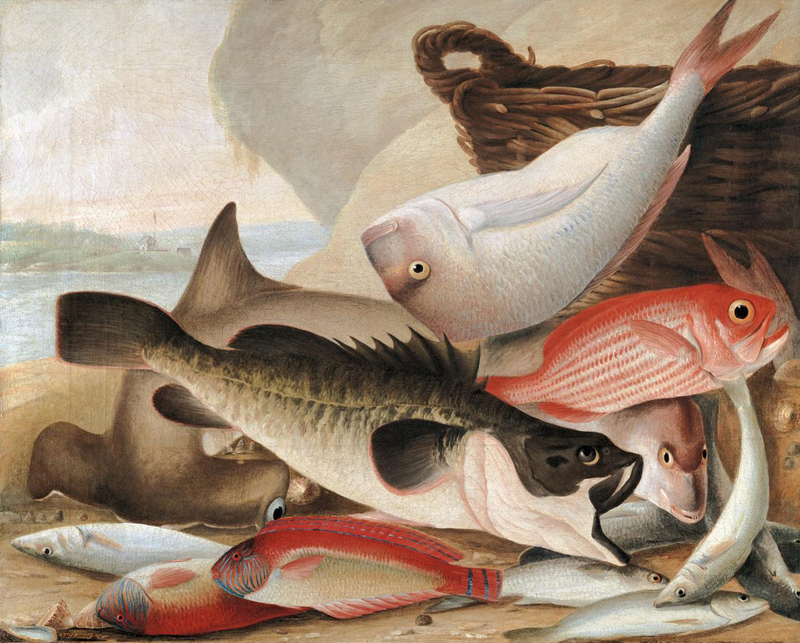 As the nineteenth century progressed, traditional life along the east coast of Australia was irrevocably changed. 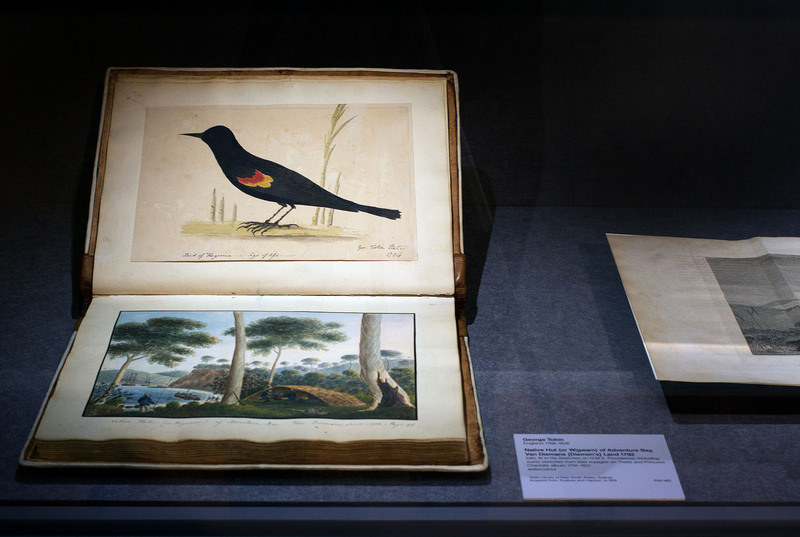 Between 1801 and 1804, skilled British navigator Matthew Flinders and his crew aboard the Investigator circumnavigated Australia, funded by the Royal Society and its president Sir Joseph Banks. 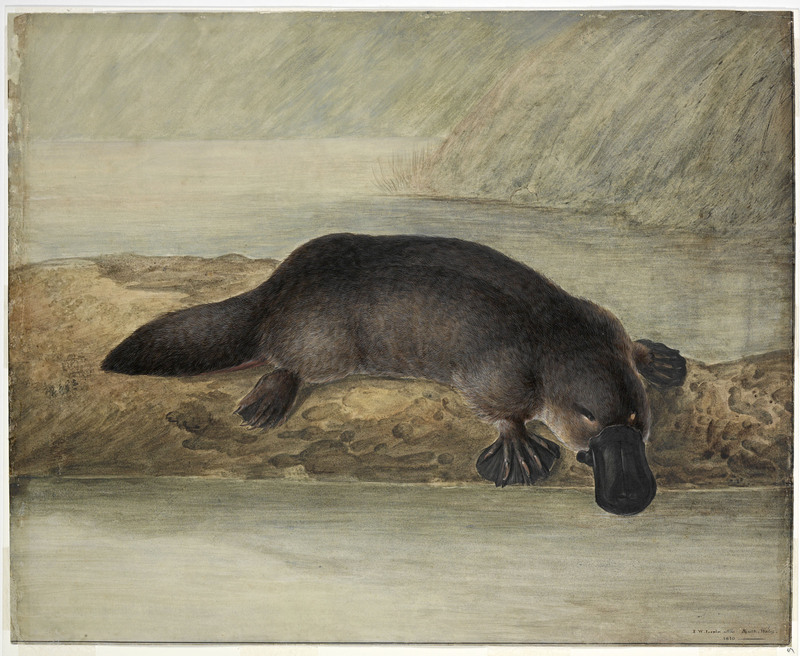 Their directive was to chart the final stretch of southern coastline that remained unknown on European maps, and learn more about the continent’s extraordinary natural history. A similar French expedition led by Nicolas Baudin on the Géographe and the Naturaliste had already commenced (1800-04). 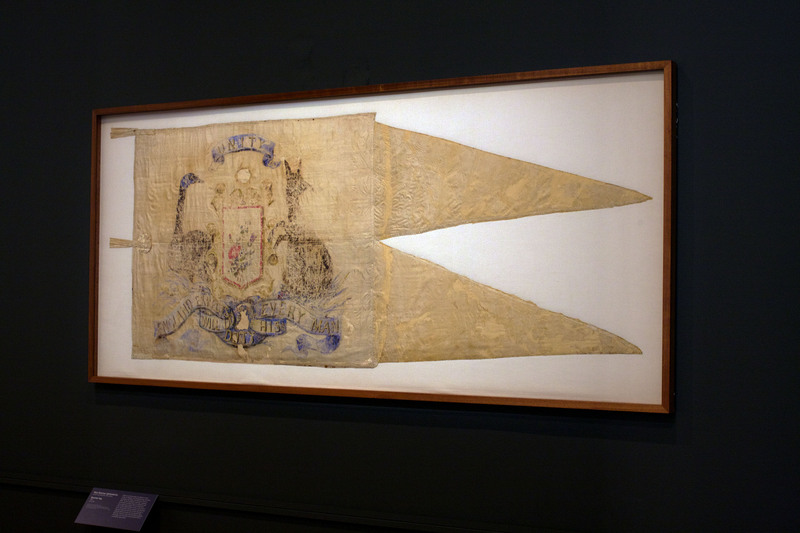 Sent by the Marine Ministry and Napoleon Bonaparte, the expedition sought to map and explore the unfamiliar land and its inhabitants; however, the British feared that it was a reconnaissance mission with a view to founding a French base in New Holland or Van Diemen’s Land. 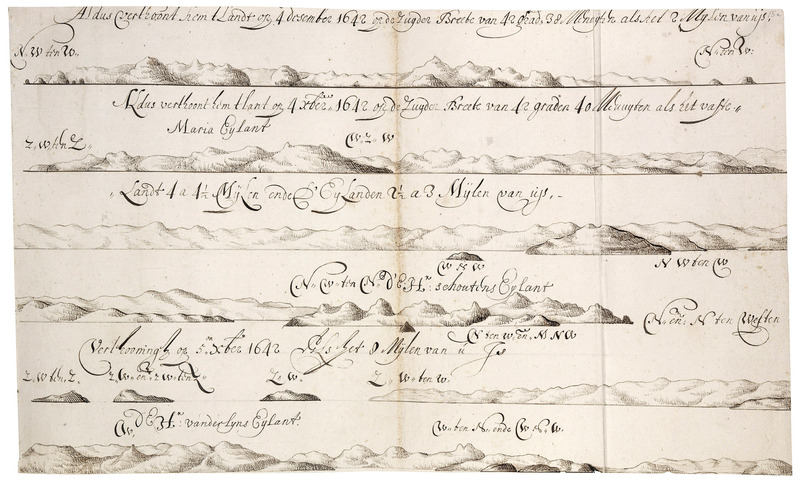 In the late eighteenth and nineteenth centuries, the world was being studied and described by Europeans on a scale never seen before. 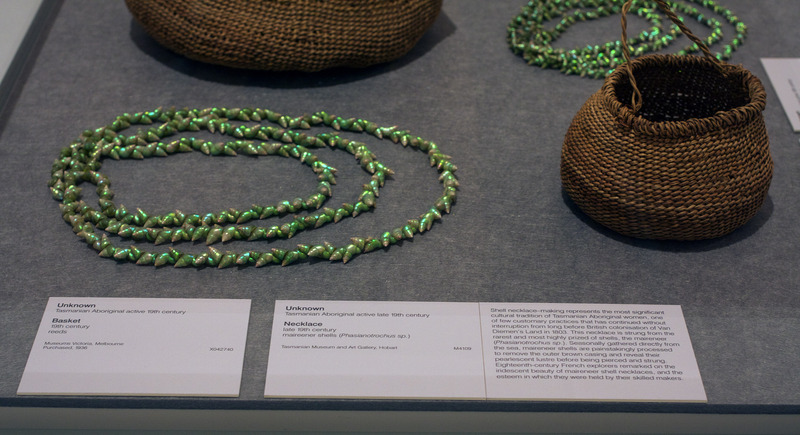 Exploration in the Pacific revealed unanticipated communities and environments and the vast quantities of material brought back – objects, artefacts, specimens, maps, records, descriptions – were regarded with awe and astonishment. 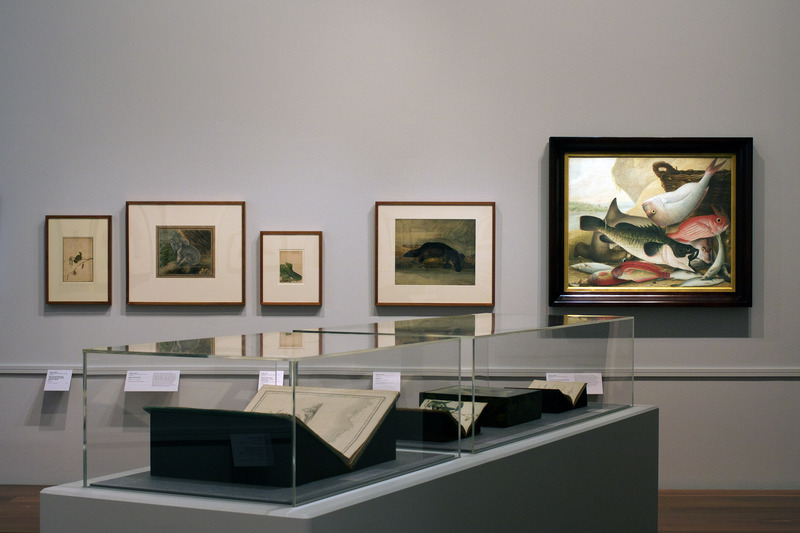 Enlightenment ambitions to understand the world through empirical observation led to intense scientific scrutiny, as people sought to comprehend and to classify this exciting, bemusing abundance. 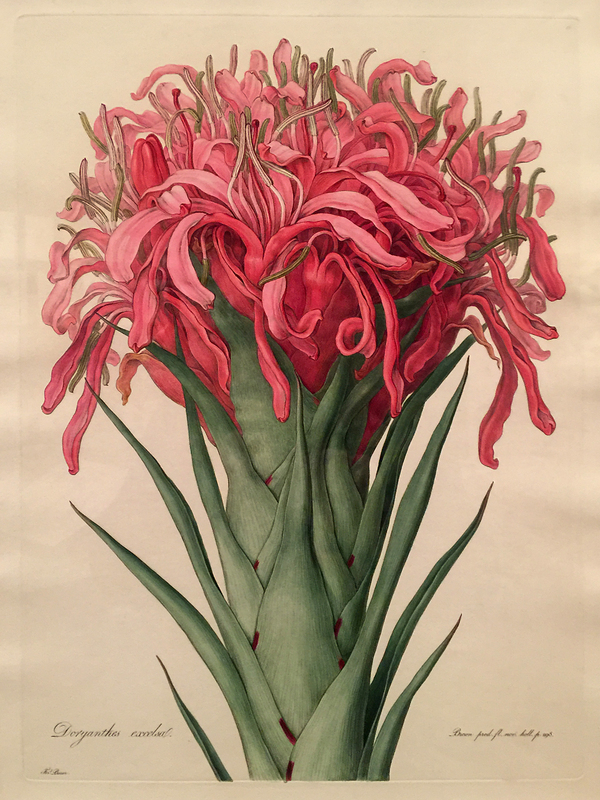 In this period, visual imagery became increasingly important, far exceeding a written description and surpassing dried or dead specimens in its ability to depict form, texture, colour, oddity and beauty. 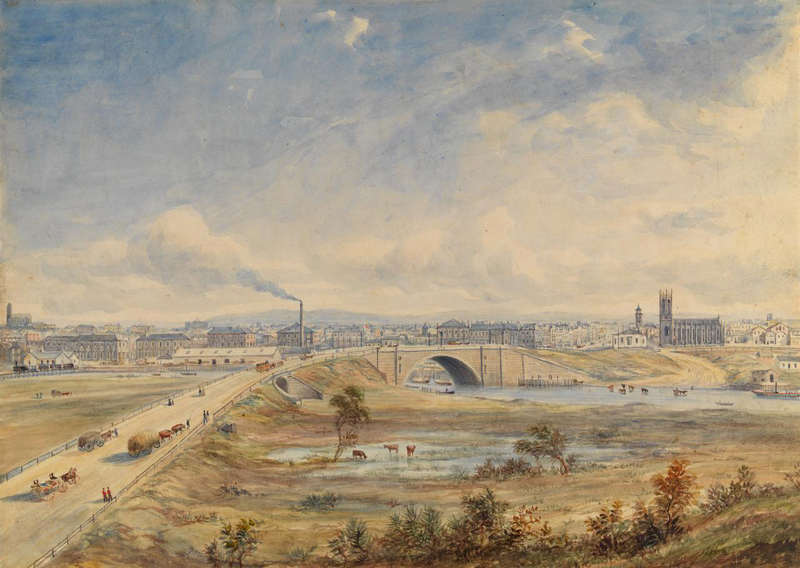 A penal settlement was established in Newcastle in 1804 as a place of secondary punishment for convicts. The area was rich in natural resources, including timber in the hinterland, large deposits of coal in the cliffs at the entrance to the harbour and shell middens for lime burning. 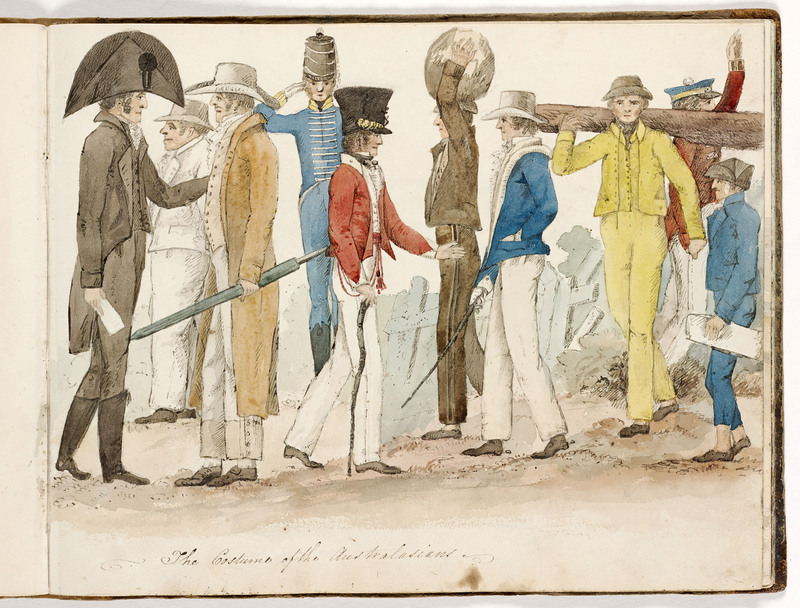 Reoffenders sent to Newcastle experienced gruelling physical labour extracting these materials and desertion occurred frequently. 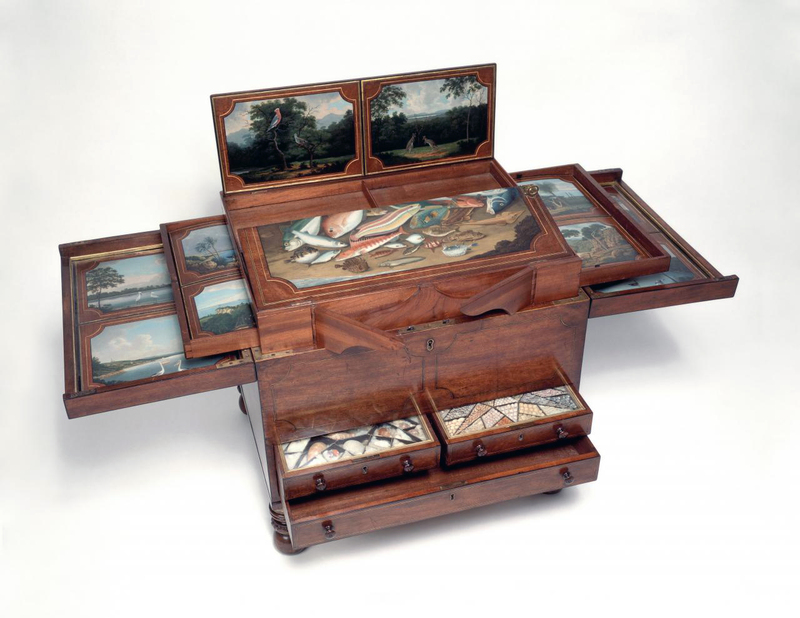 The Dixson collector’s chest, c. 1818-20, and its close relation, the Macquarie collector’s chest, c. 1818, are rare examples of colonial ‘cabinets of curiosity’ and among the most fascinating and complex objects of the colonial period. 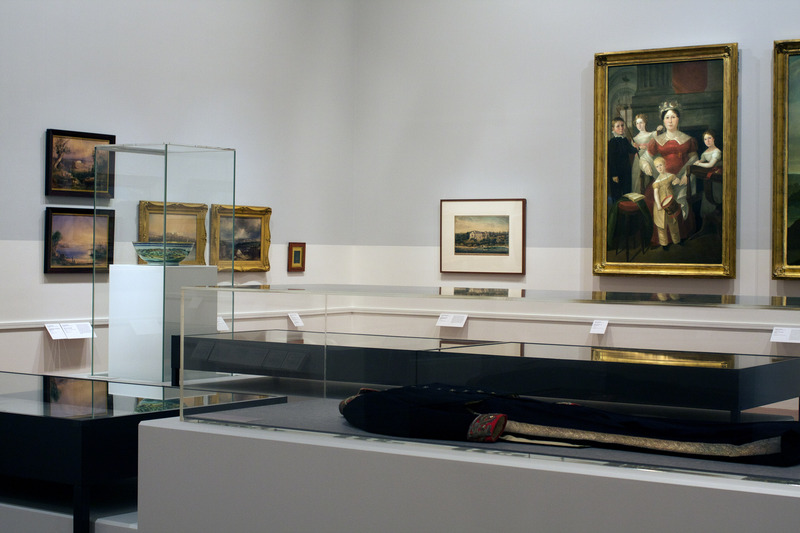 The Macquarie collector’s chest was commissioned and likely designed by Captain James Wallis, commandant of Newcastle, to present to Governor Lachlan Macquarie. 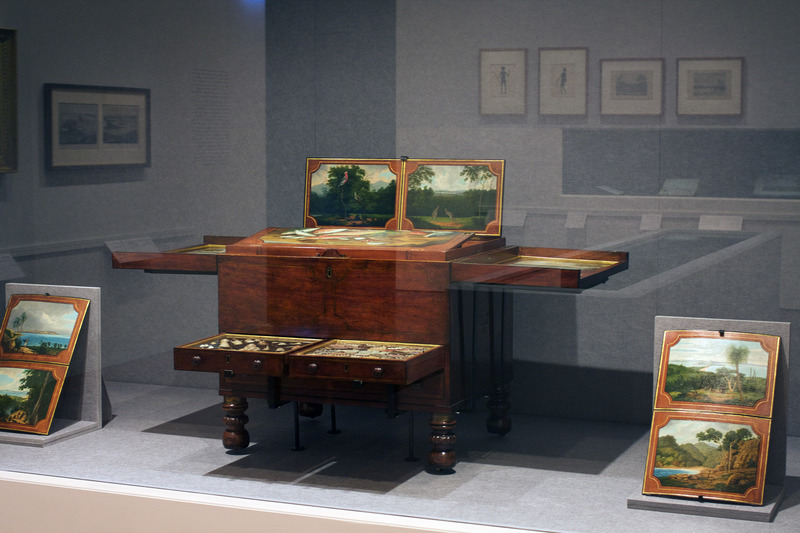 It is debated whether the Dixson collector’s chest, on display here, was produced as its prototype or subsequently as a second version. 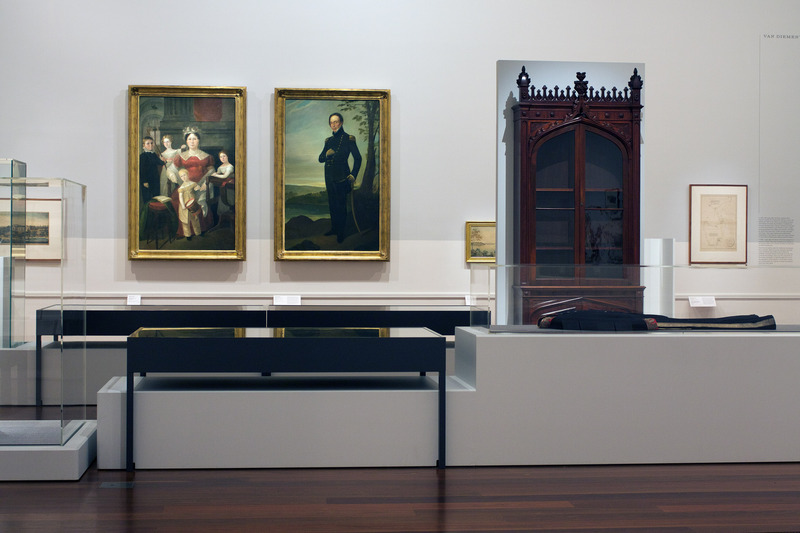 Crafted by expert convict cabinet-makers from local Australian timbers, the cabinet opens to reveal painted panels by convict artist Joseph Lycett. 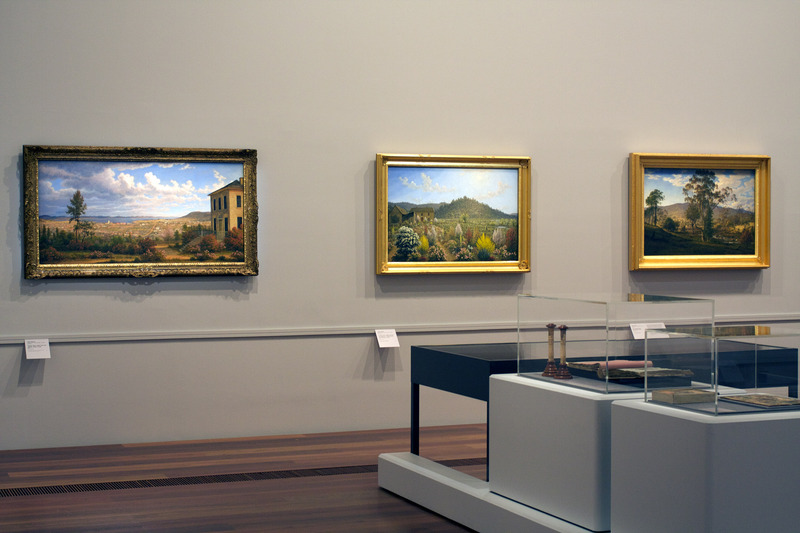 Several show the Newcastle region, while others are painted after views by exploration artist William Westall. 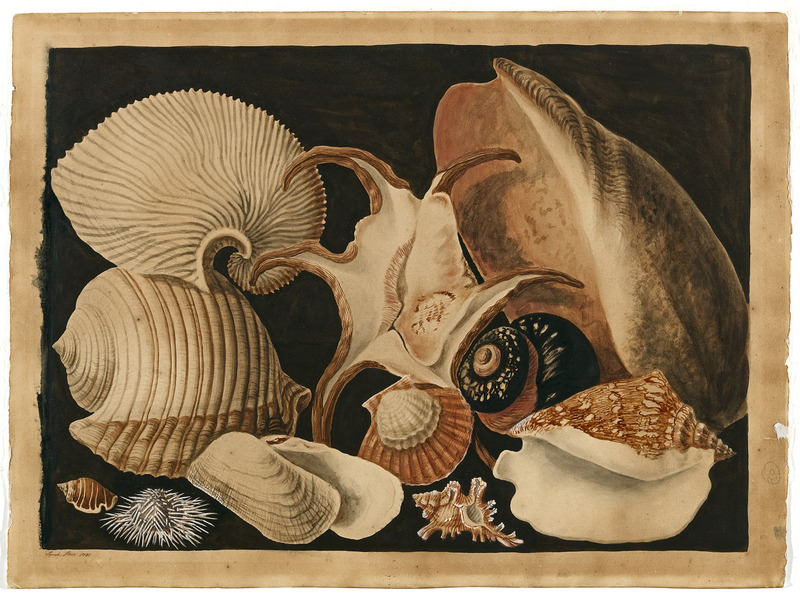 The drawers contain shells and originally would have also held other natural history specimens including birds, insects, coral and seaweed, tagged and arranged fastidiously by shape, colour and/or type. 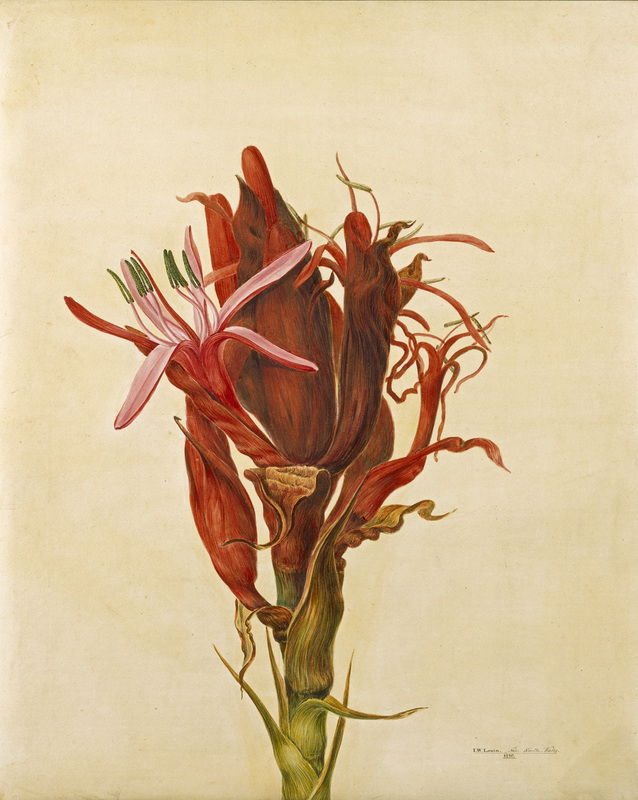 It is believed these specimens were collected with the assistance of the local Awabakal people, as Wallis had an amicable relationship with their kinsman Burigon. 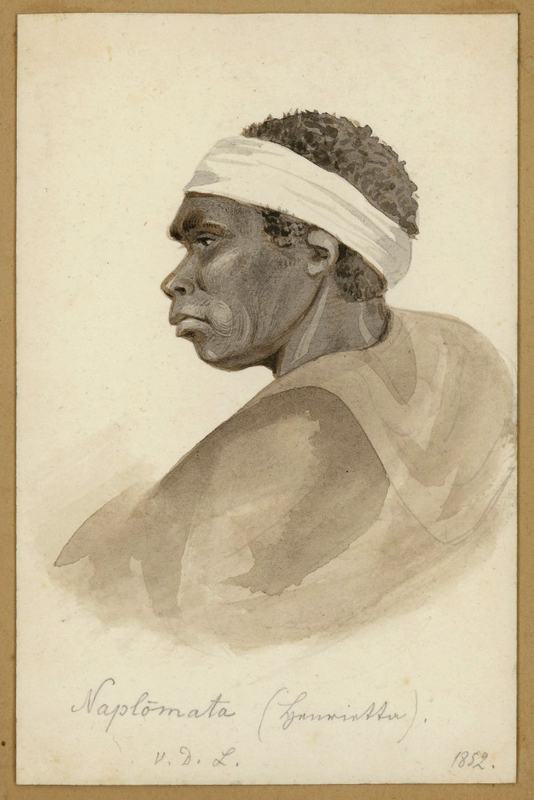 Bungaree, or Boongaree, (1775 – 24 November 1830) was an Aboriginal Australian from the Kuringgai people of the Broken Bay area, who was known as an explorer, entertainer, and Aboriginal community leader. 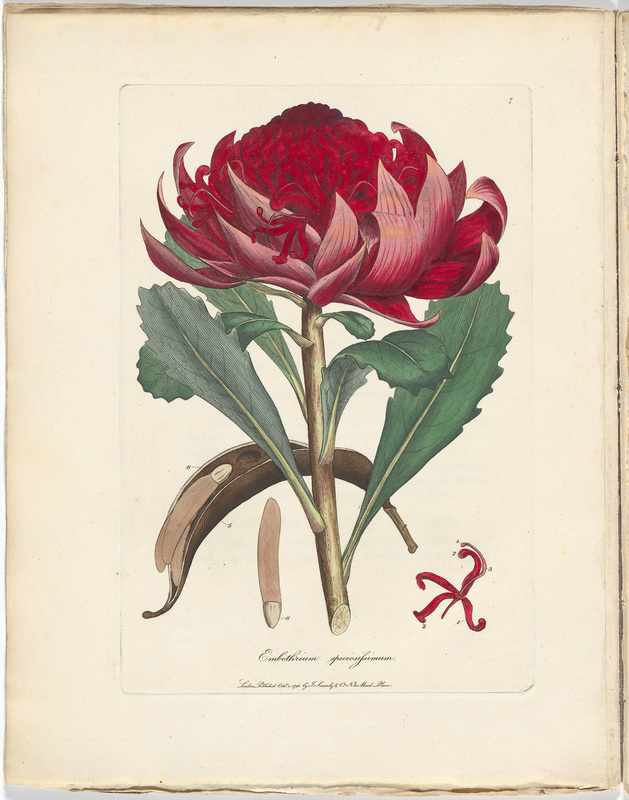 He is significant in that he was the first person to be recorded in print as an Australian. 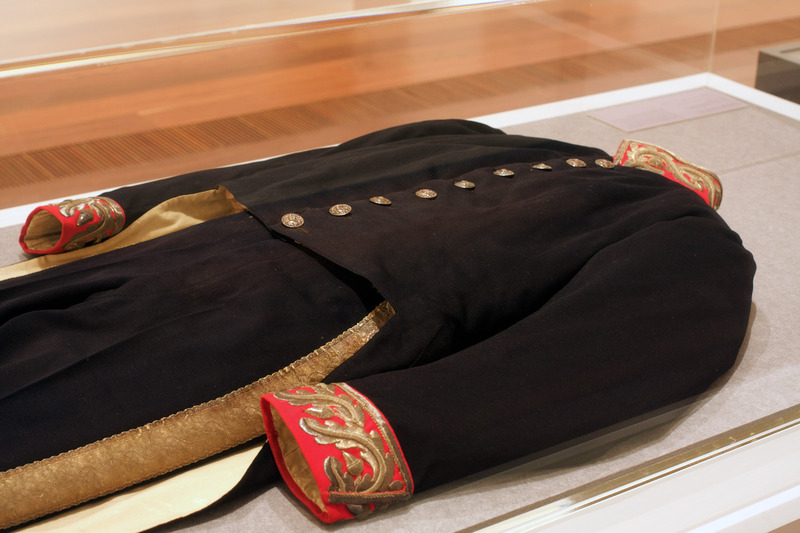 By the end of his life, he had become a familiar sight in colonial Sydney, dressed in a succession of military and naval uniforms that had been given to him. 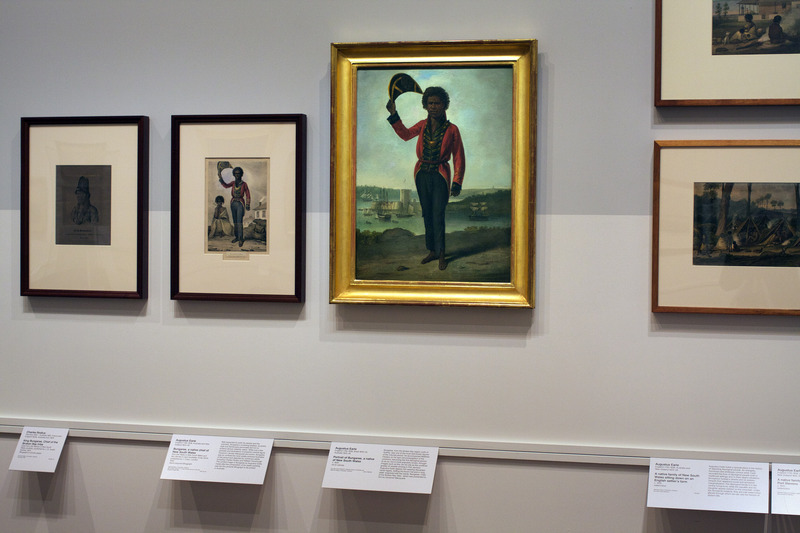 His distinctive outfits and notoriety within colonial society, as well as his gift for humour and mimicry, especially his impressions of past and present governors, made him a popular subject for portrait painters. 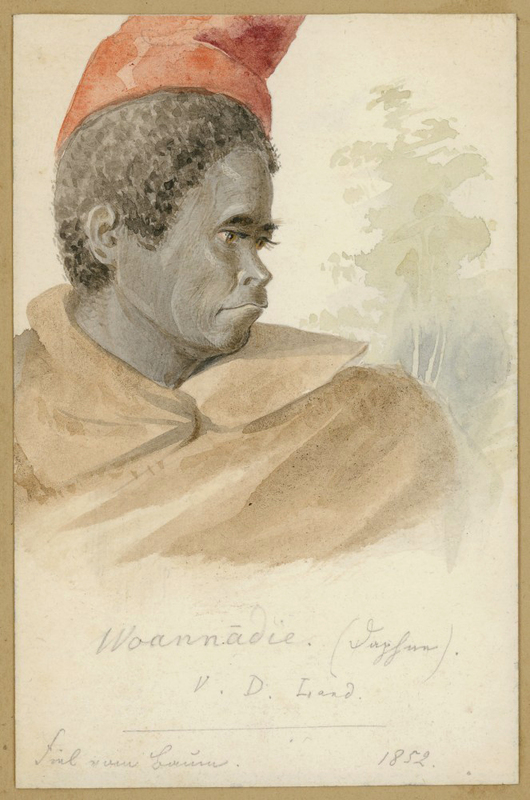 Bungaree first came to prominence in 1798, when he accompanied Matthew Flinders on a coastal survey as an interpreter, guide and negotiator with local indigenous groups. 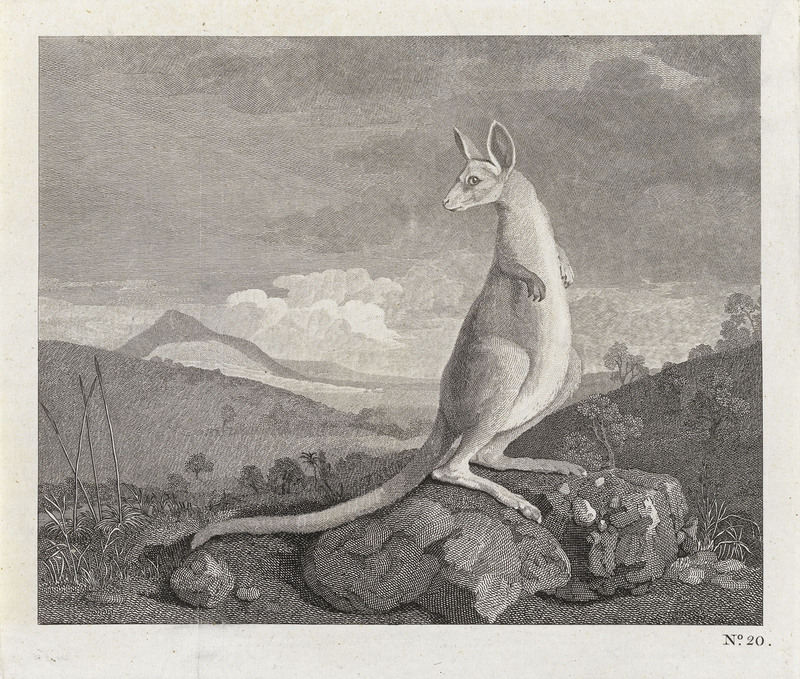 He later accompanied Flinders on his circumnavigation of Australia between 1801 and 1803 in the Investigator. 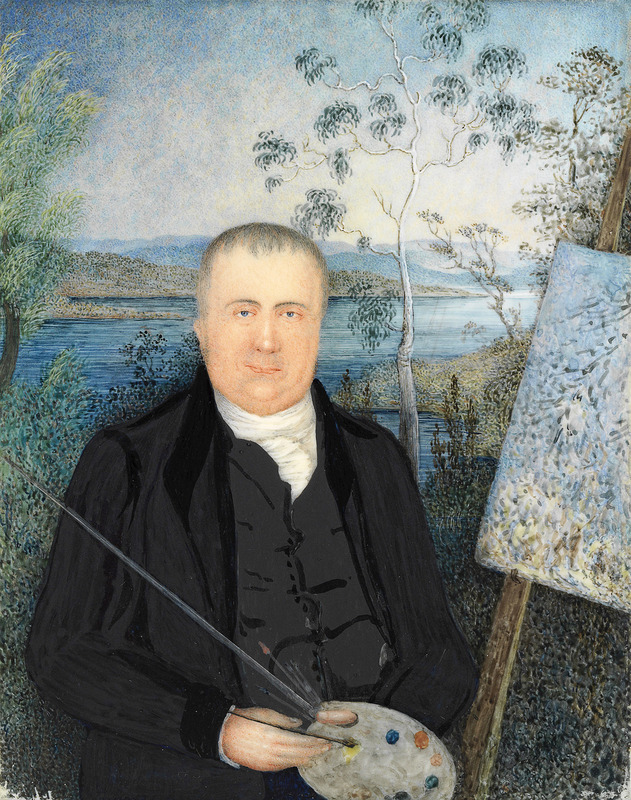 Flinders was the cartographer of the first complete map of Australia, filling in the gaps from previous cartographic expeditions, and was the most prominent advocate for naming the continent “Australia”. 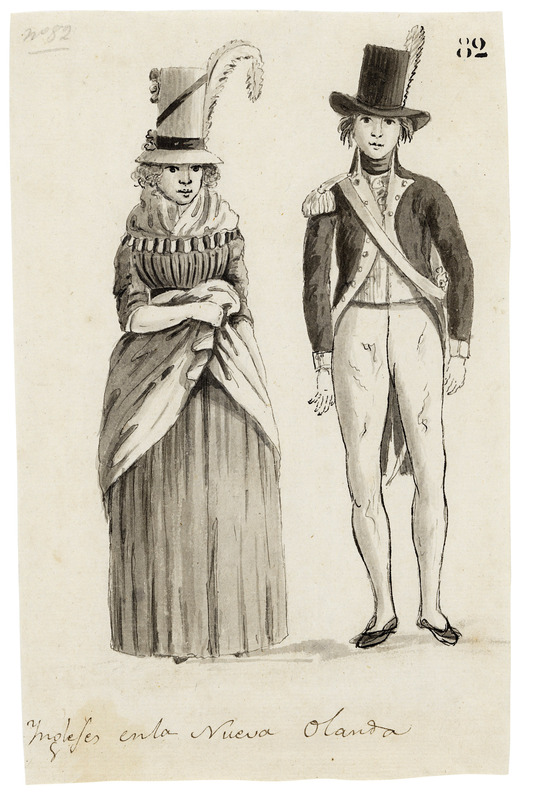 Flinders noted that Bungaree was “a worthy and brave fellow” who, on multiple occasions, saved the expedition. 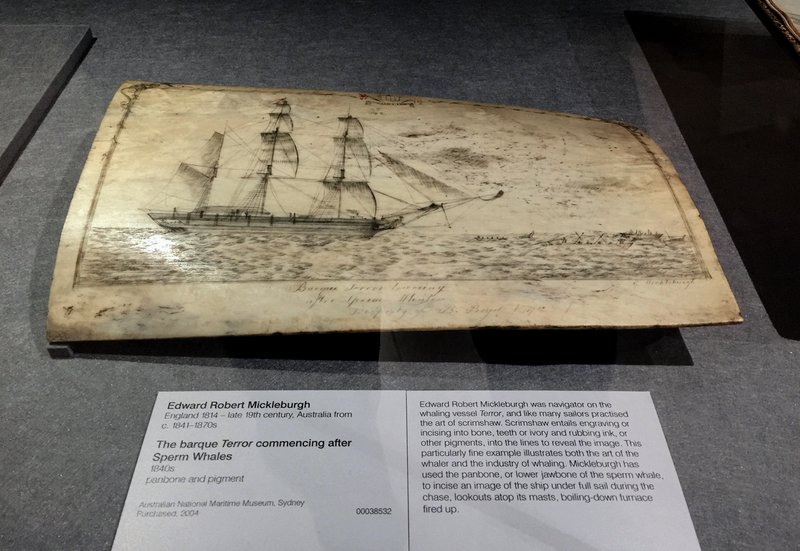 Bungaree continued his association with exploratory voyages when he accompanied Phillip Parker King to north-western Australia in 1817 in the Mermaid. 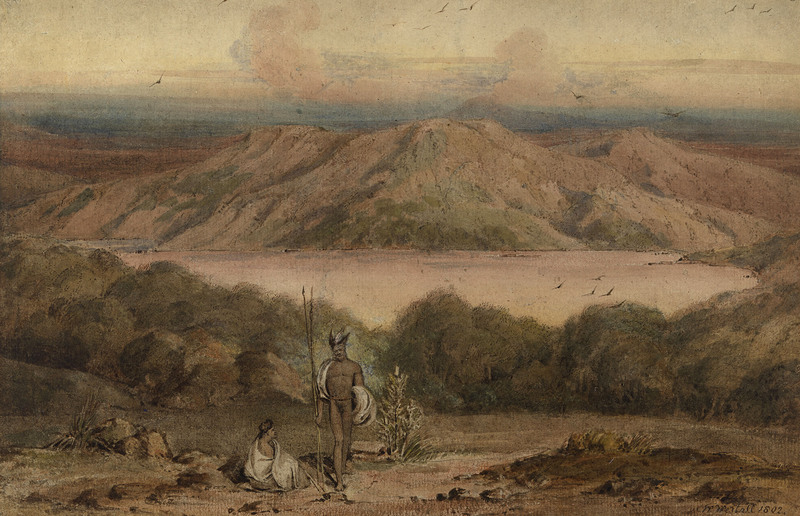 In 1815, Governor Lachlan Macquarie dubbed Bungaree “Chief of the Broken Bay Tribe” and presented him with 15 acres (61,000 m2) of land on George’s Head. 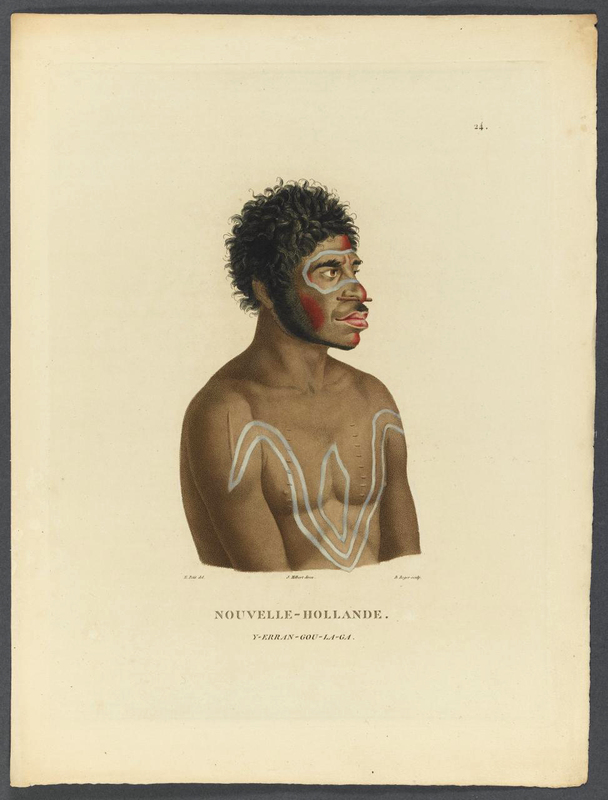 He also received a breastplate inscribed “BOONGAREE – Chief of the Broken Bay Tribe – 1815”. 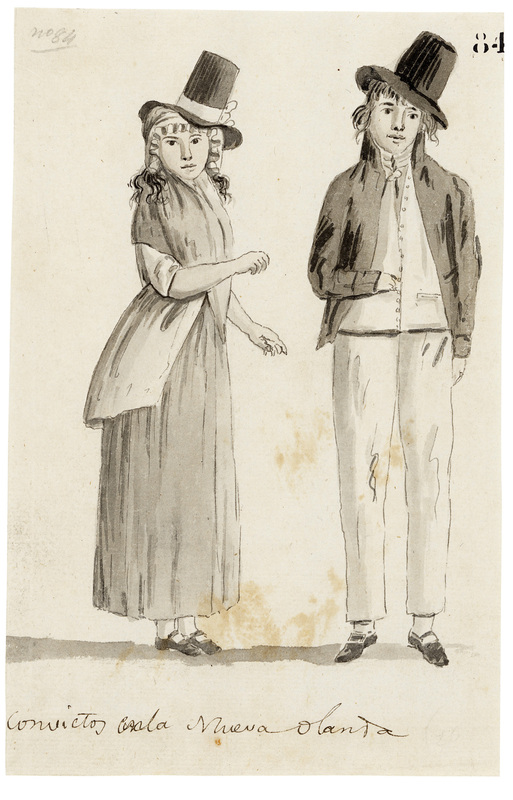 Bungaree was also known by the titles “King of Port Jackson” and “King of the Blacks”. 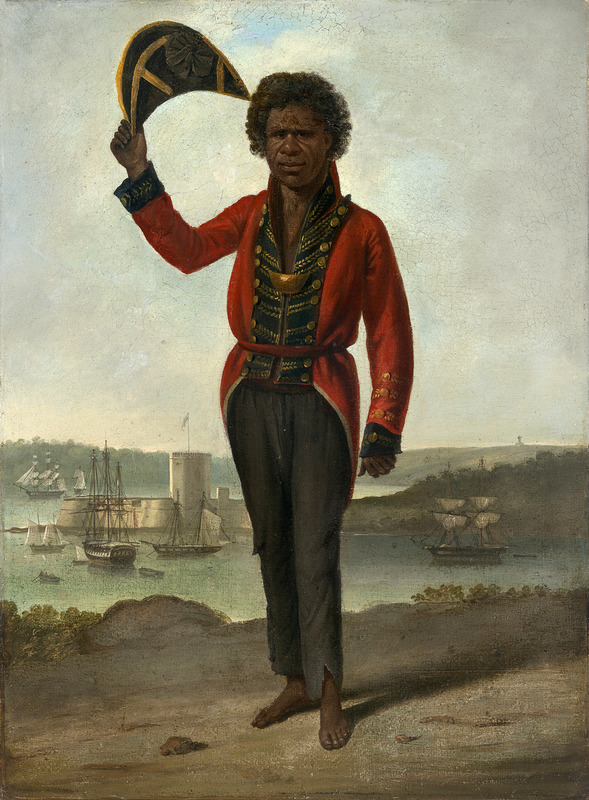 Bungaree spent the rest of his life ceremonially welcoming visitors to Australia, educating people about Aboriginal culture (especially boomerang throwing), and soliciting tribute, especially from ships visiting Sydney. 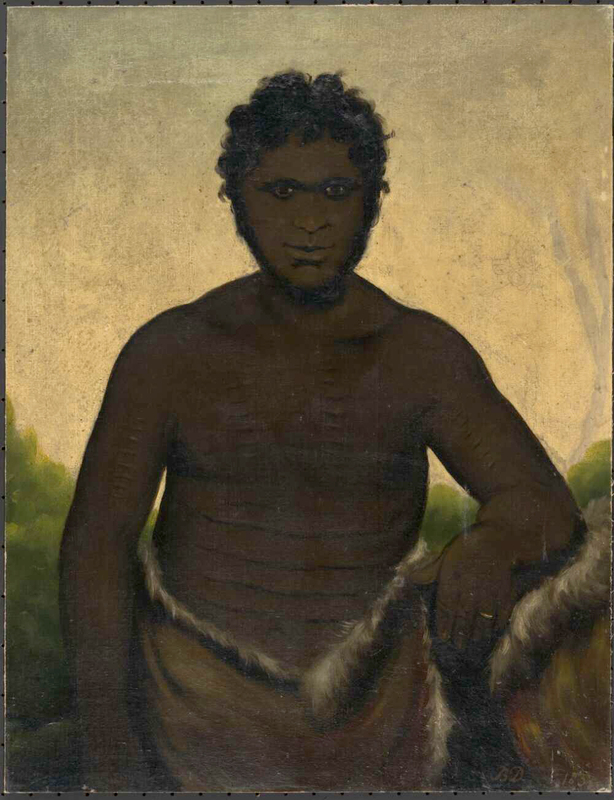 In 1828, he and his clan moved to the Governor’s Domain, and were given rations, with Bungaree described as ‘in the last stages of human infirmity’. He died at Garden Island on 24 November 1830 and was buried in Rose Bay. Obituaries of him were carried in the Sydney Gazette and The Australian. 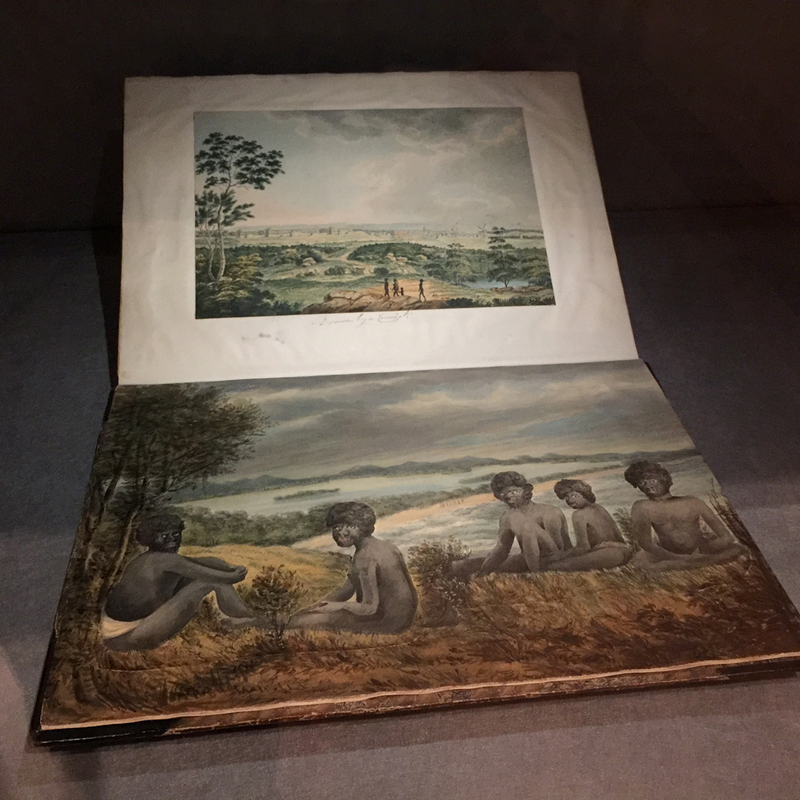 The 1810s through to the 1850s was an era of expansion for the colonists who had settled in New South Wales and a time of continuing dispossession for Aboriginal people. Transportation ended in 1840, but convict labour continued to be assigned to assist with building roads and clearing land for pastoralists. 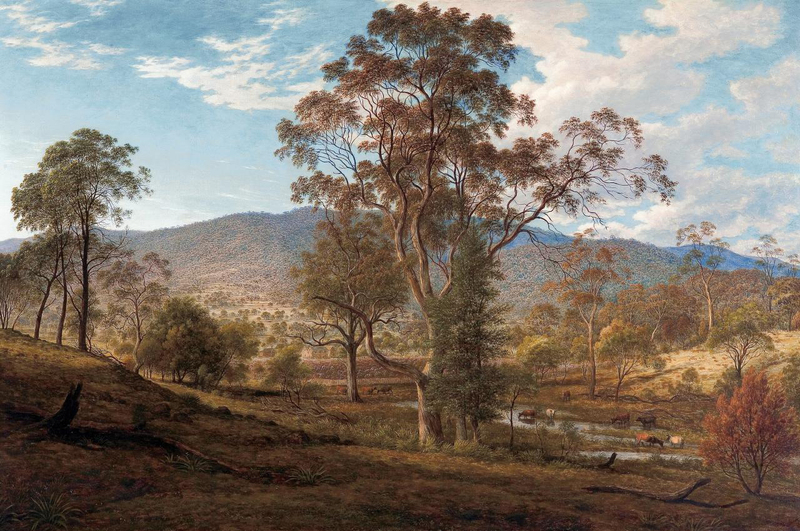 The settler population grew and continued to occupy land further inland, north and south of Sydney. 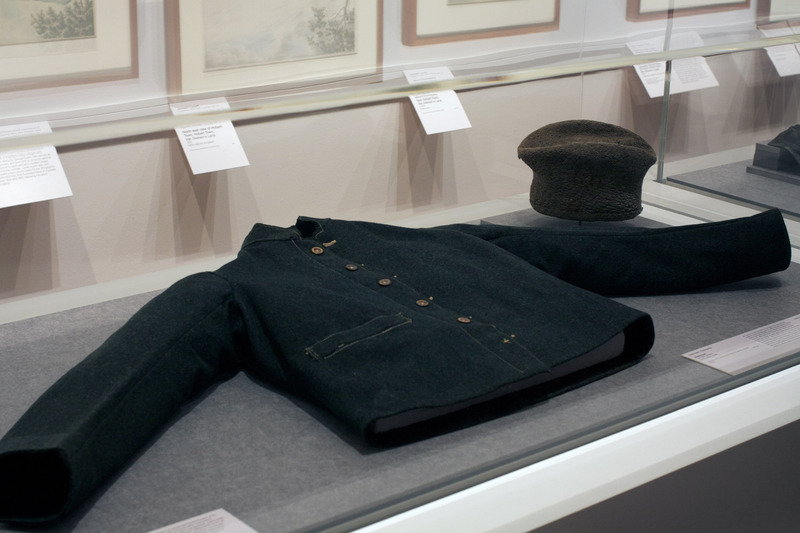 Emigration commissioners in London, and advocates within the colony, worked to encourage the arrival of free settlers, particularly women. 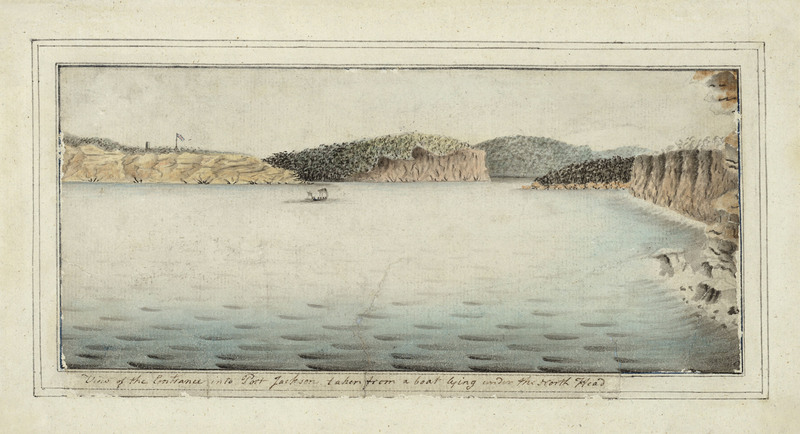 In 1803, 160 years after the Dutch explorer Abel Tasman named and charted Van Diemen’s Land, the British laid claim to the island by relocating convicts and officers from New South Wales to forestall any incursion by the French. 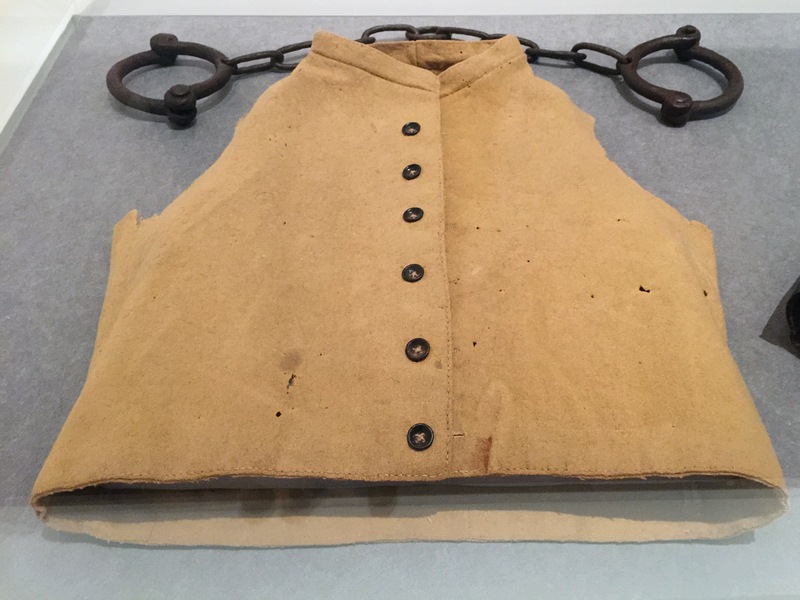 Convict transports continued to arrive intermittently in Van Diemen’s Land, mostly bringing prisoners from Britain and Ireland, until 1856, by which time more than 72,000 convicts had been sent there. 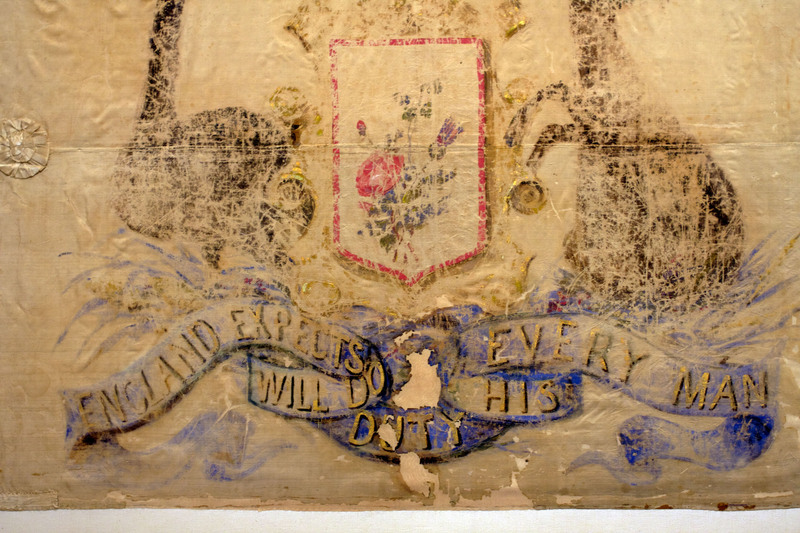 There were several penal settlements established in Van Diemen’s Land, the most notorious of which were at Macquarie Harbour and Port Arthur. 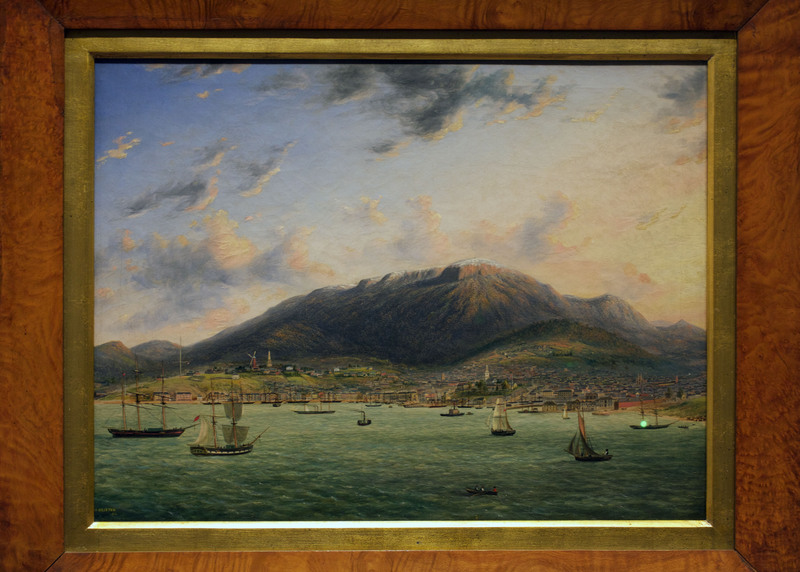 In 1804, a year after the arrival of the first transports of convicts, Hobart Town was founded on the banks of the Derwent River and it quickly became an important southern trading port. 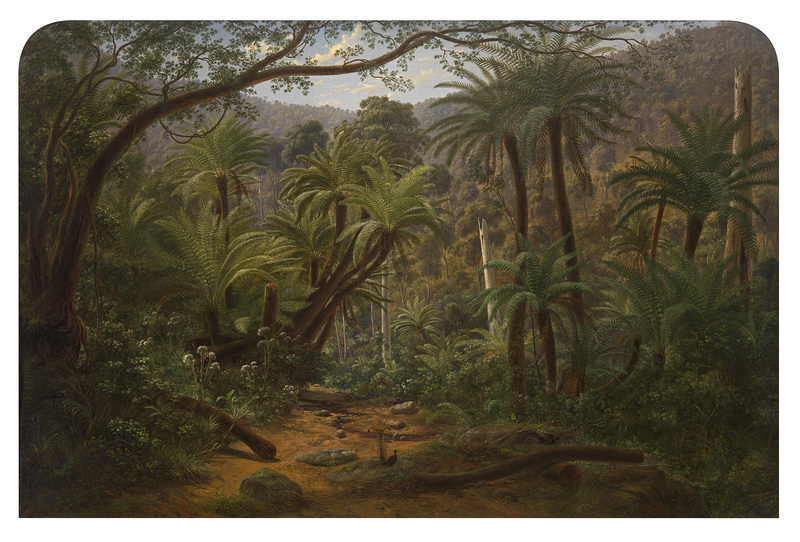 NGV Australia will host two complementary exhibitions that explore Australia’s complex colonial history and the art that emerged during and in response to this period. 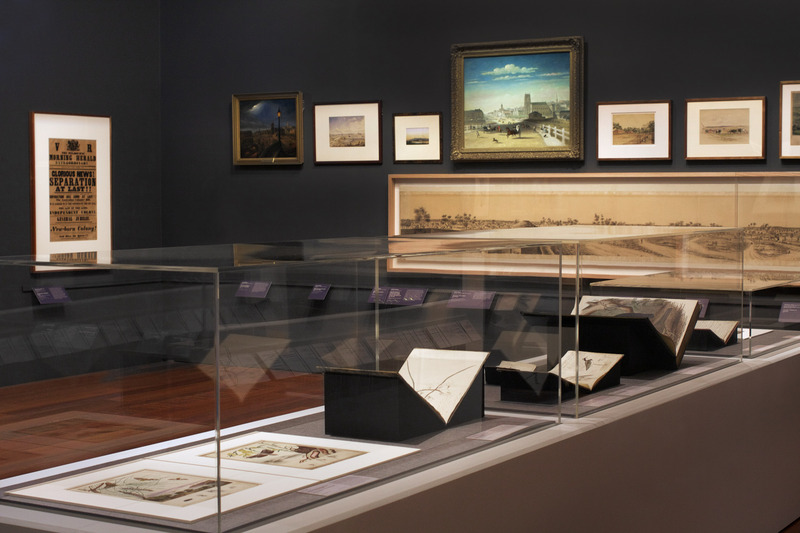 Presented concurrently, these two ambitious and large-scale exhibitions, Colony: Australia 1770-1861 and Colony: Frontier Wars, offer differing perspectives on the colonisation of Australia. 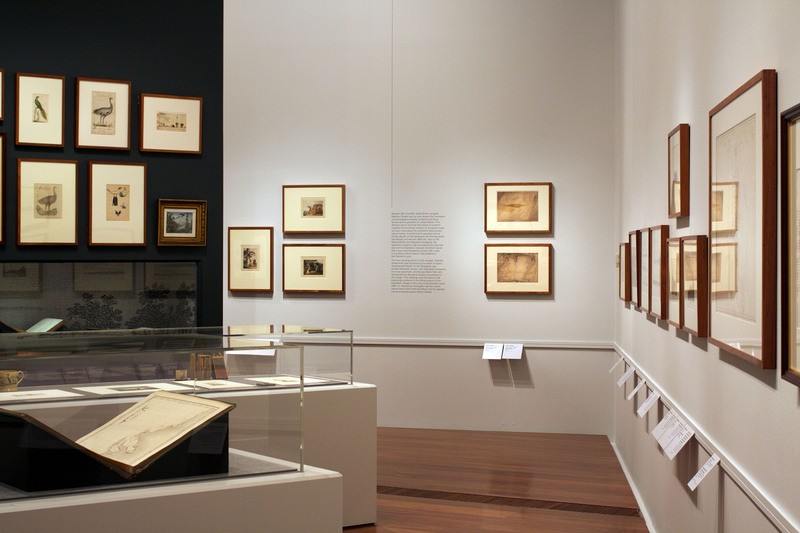 Featuring an unprecedented assemblage of loans from major public institutions around Australia, Colony: Australia 1770-1861 is the most comprehensive survey of Australian colonial art to date. 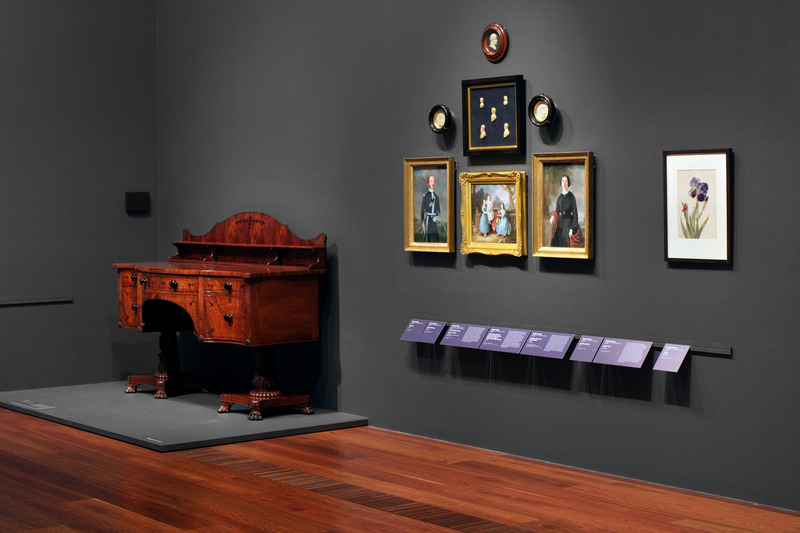 The exhibition explores the rich diversity of art, craft and design produced between 1770, the arrival of Lieutenant James Cook and the Endeavour, and 1861, the year the NGV was established. 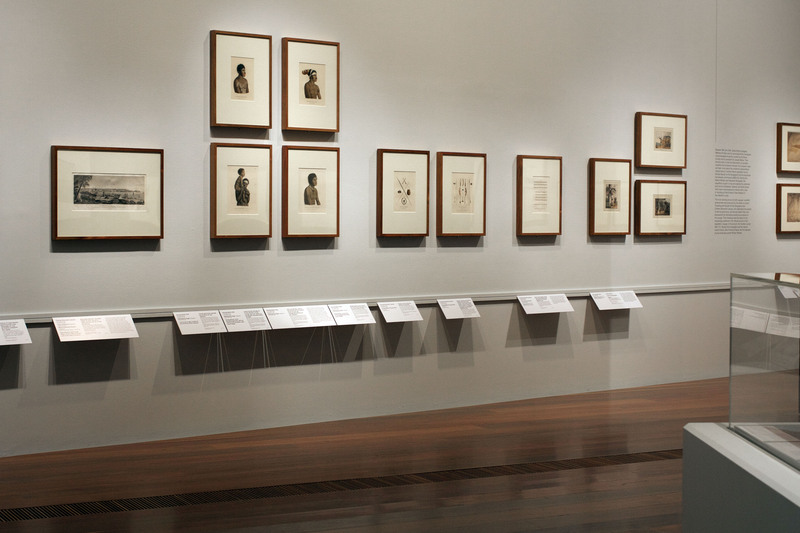 The counterpoint to Colony: Australia 1770-1861, Colony: Frontier Wars presents a powerful response to colonisation through a range of historical and contemporary works by Indigenous and non-Indigenous artists dating from pre-contact times to present day. 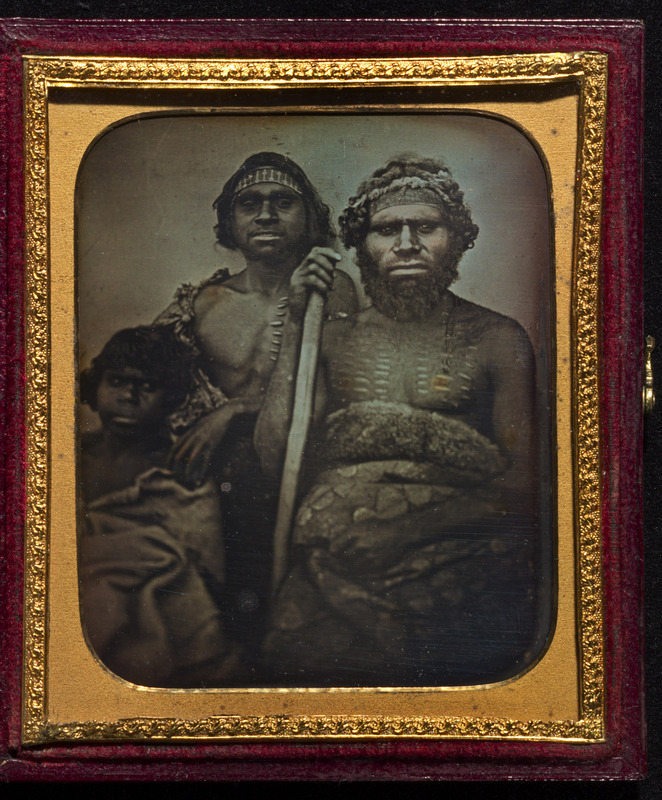 From nineteenth-century drawings by esteemed Wurundjeri artist and leader, William Barak, to the iridescent LED light boxes of Jonathan Jones, this exhibition reveals how Aboriginal people have responded to the arrival of Europeans with art that is diverse, powerful and compelling. 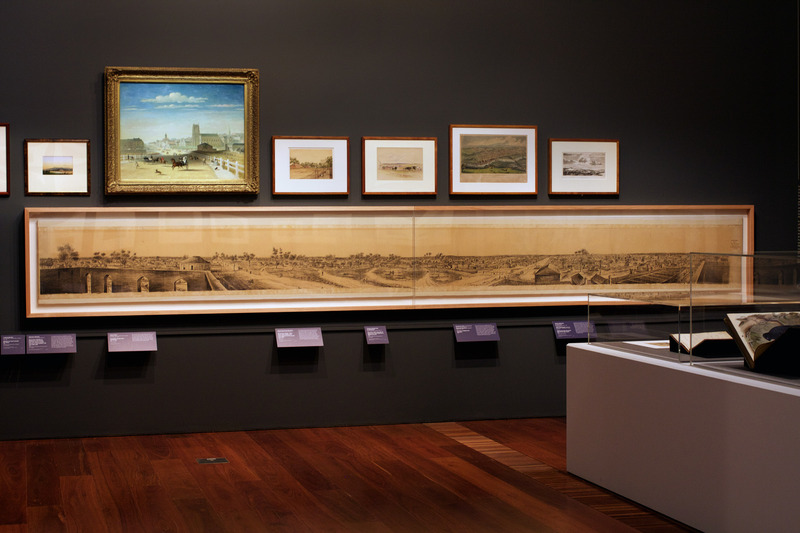 Tony Ellwood, Director, NGV said: ‘Cook’s landing marks the beginning of a history that still has repercussions today. 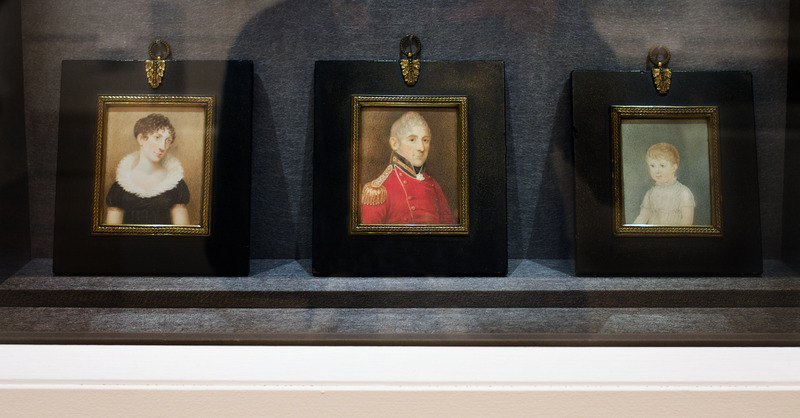 This two-part exhibition presents different perspectives of a shared history with unprecedented depth and scope, featuring a breadth of works never-before-seen in Victoria. 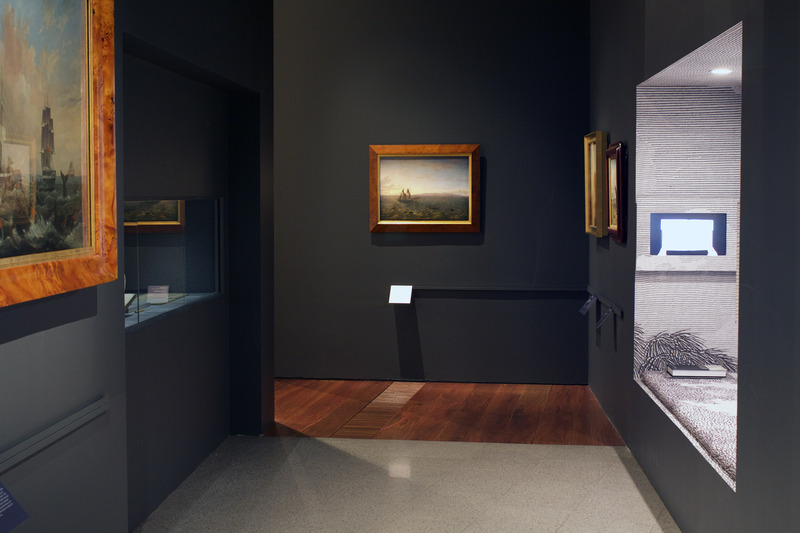 In order to realise this ambitious project, we have drawn upon the expertise and scholarship of many individuals from both within and outside the NGV. We are extremely grateful to the Aboriginal Elders and advisory groups who have offered their guidance, expertise and support,’ said Ellwood. 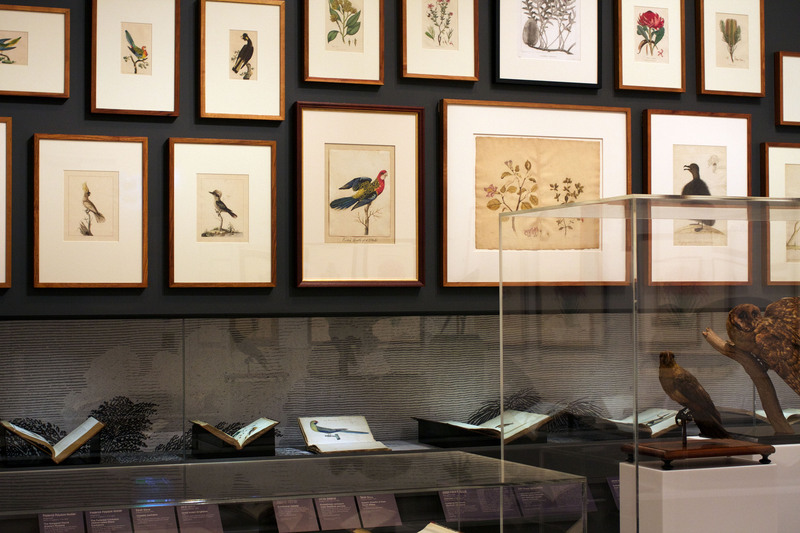 Charting key moments of history, life and culture in the colonies, Colony: Australia 1770-1861 includes over 600 diverse and significant works, including examples of historical Aboriginal cultural objects, early watercolours, illustrated books, drawings, prints, paintings, sculpture and photographs, to a selection of furniture, fashion, textiles, decorative arts, and even taxidermy specimens. 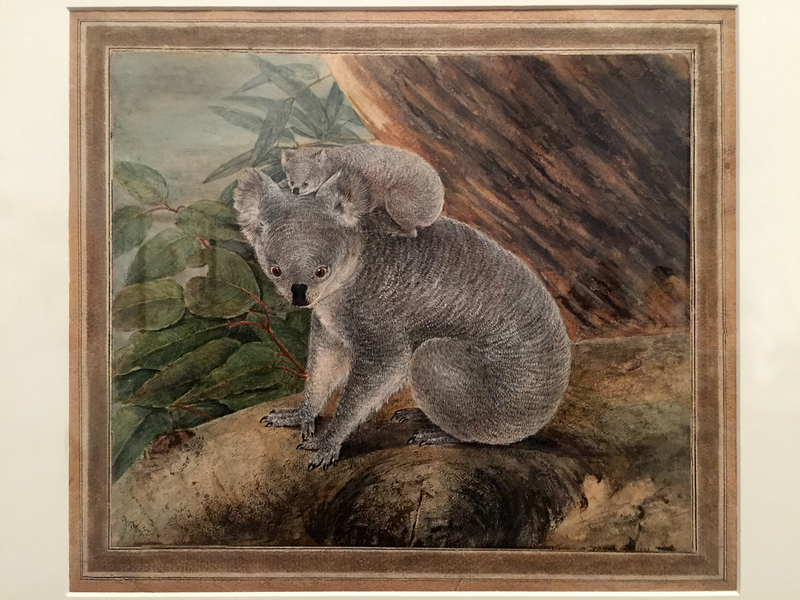 Highlights from the exhibition include a wondrous ‘cabinet of curiosities’ showcasing the earliest European images of Australian flowers and animals, including the first Western image of a kangaroo and illustrations by the talented young water colourist Sarah Stone. 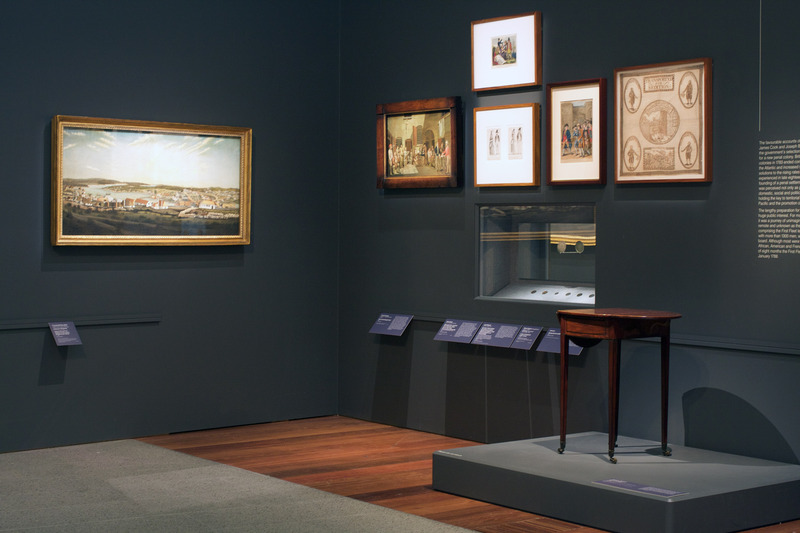 Examples of early colonial cabinetmaking also feature, including the convict made and decorated Dixson chest containing shells and natural history specimens, as well as a rarely seen panorama of Melbourne in 1841 will also be on display. 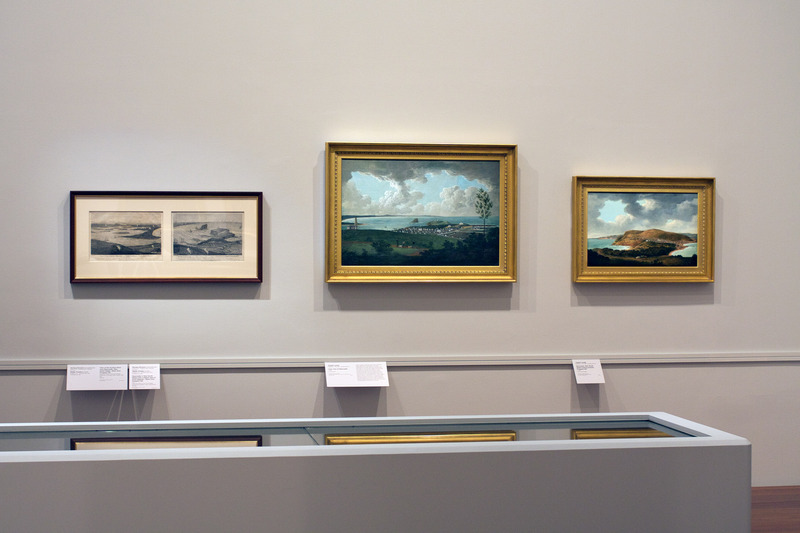 Following the development of Western art and culture, the exhibition includes early drawings and paintings by convict artists such as convicted forgers Thomas Watling and Joseph Lycett; the first oil painting produced in the colonies by professional artist John Lewin; work by the earliest professional female artists, Mary Morton Allport, Martha Berkeley and Theresa Walker; landscapes by John Glover and Eugene von Guérard; photographs by the first professional photographer in Australia, George Goodman, and a set of Douglas Kilburn’s silver-plated daguerreotypes, which are the earliest extant photographs of Indigenous peoples. Colony: Frontier Wars attests to the resilience of culture and Community, and addresses difficult aspects of Australia’s shared history, including dispossession and the stolen generation, through the works of Julie Gough, Brook Andrew, Maree Clarke, Ricky Maynard, Marlene Gilson, Julie Dowling, S. T. Gill, J. W. Lindt, Gordon Bennett, Arthur Boyd, Tommy McRae, Christian Thompson, and many more. 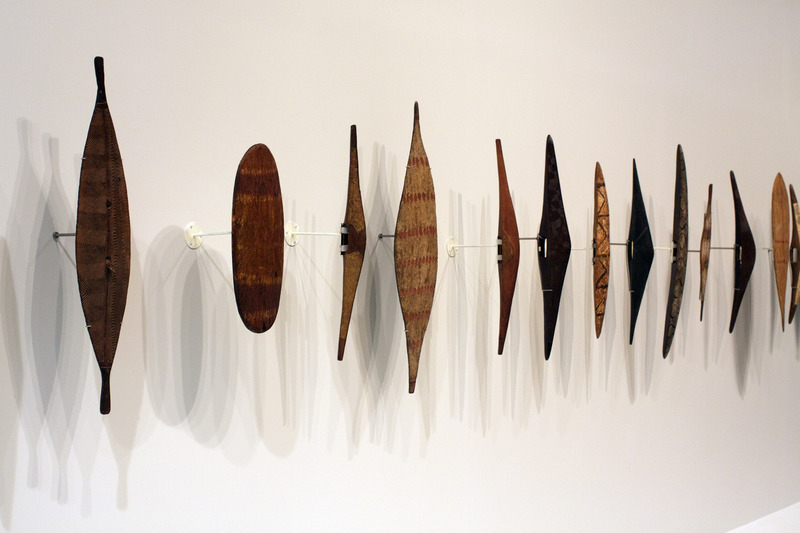 Giving presence to the countless makers whose identities have been lost as a consequence of colonialism, Colony: Frontier Wars also includes a collection of anonymous photographic portraits and historical cultural objects, including shields, clubs, spear throwers and spears, by makers whose names, language groups and Countries were not recorded at the time of collection. 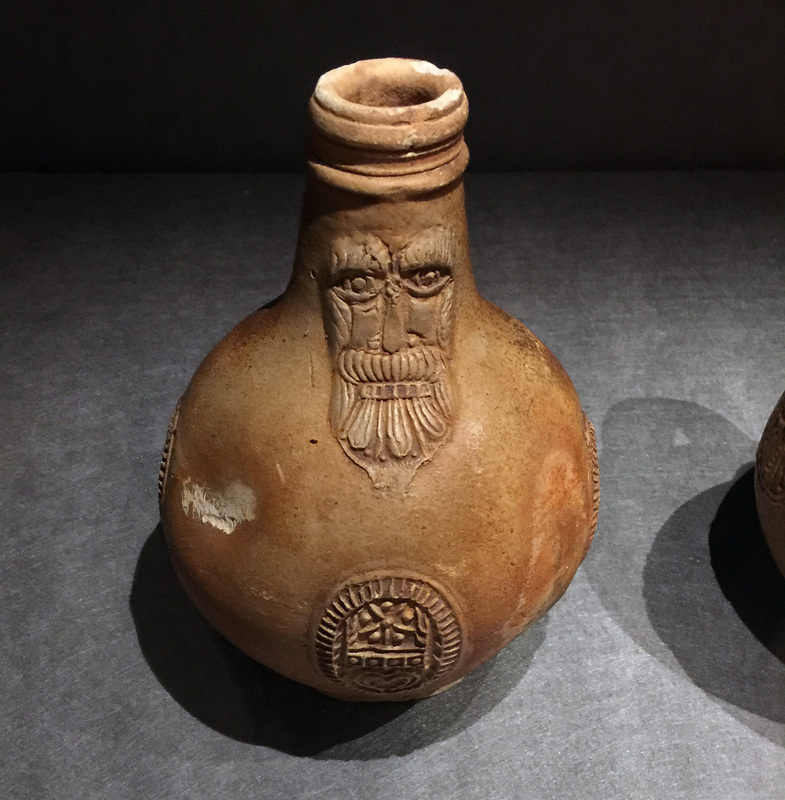 Challenging global museum conventions, the exhibition will credit the subjects and makers of these cultural objects as ‘once known’ rather than ‘unknown’. This sharply waisted coffee pot, with its flat lid and nipped-in knob, is of a traditional German type. 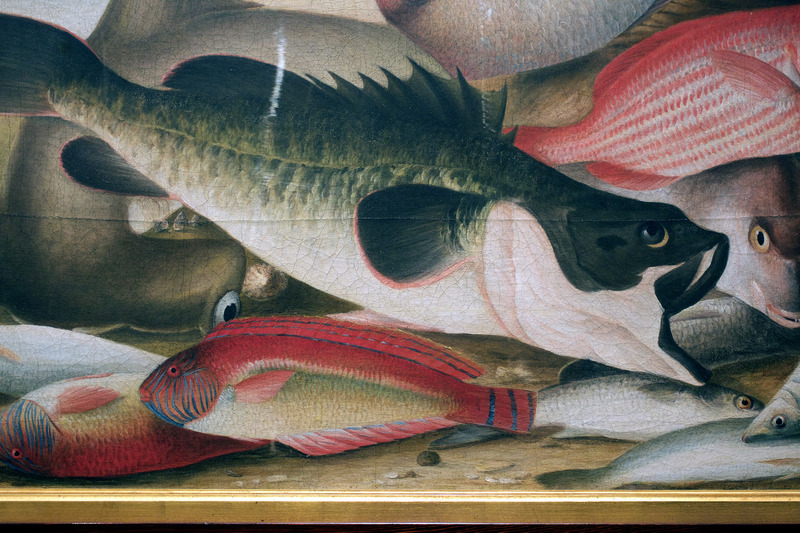 Fritsch arrived in Melbourne from Schwarzenbek in northern Germany in 1849, accompanied by his wife and four children. 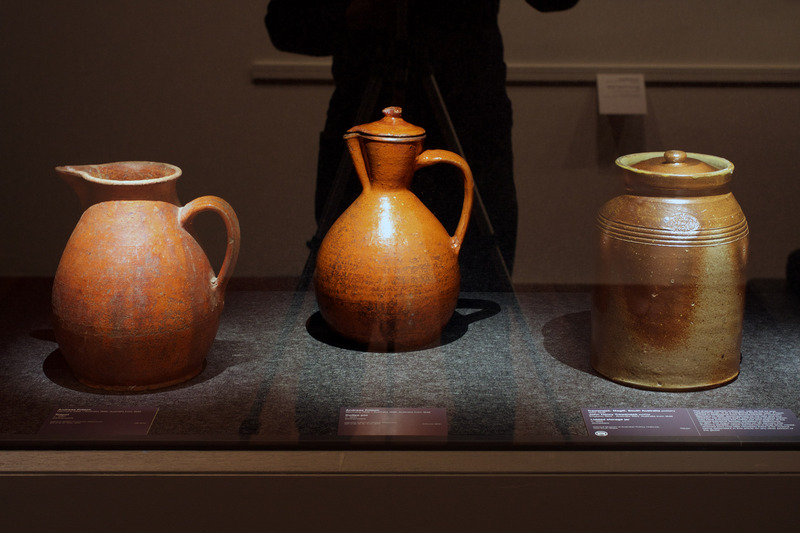 He showed eight earthenware objects (which may have included this coffee pot and teapot) at the Victoria Industrial Society exhibition in Melbourne in 1851. The Argus commented on 30 January that Fritsch’s exhibits, which earned him a large silver medal, ‘shewed [sic] how little necessity there is for Victoria being dependent in this article on any other portion of the globe’. 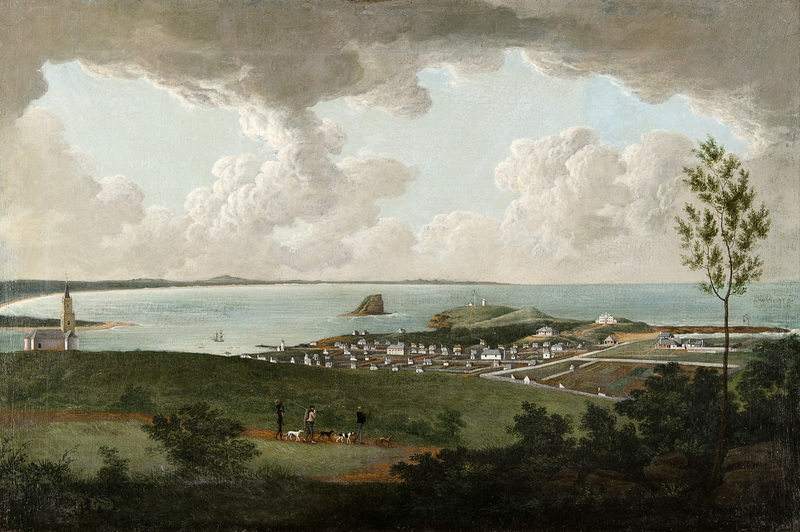 The increased arrival of free settlers from the 1820s onwards saw the colony of Van Diemen’s Land evolve from a brutal penal settlement into an economically sound and vibrant cultural centre. 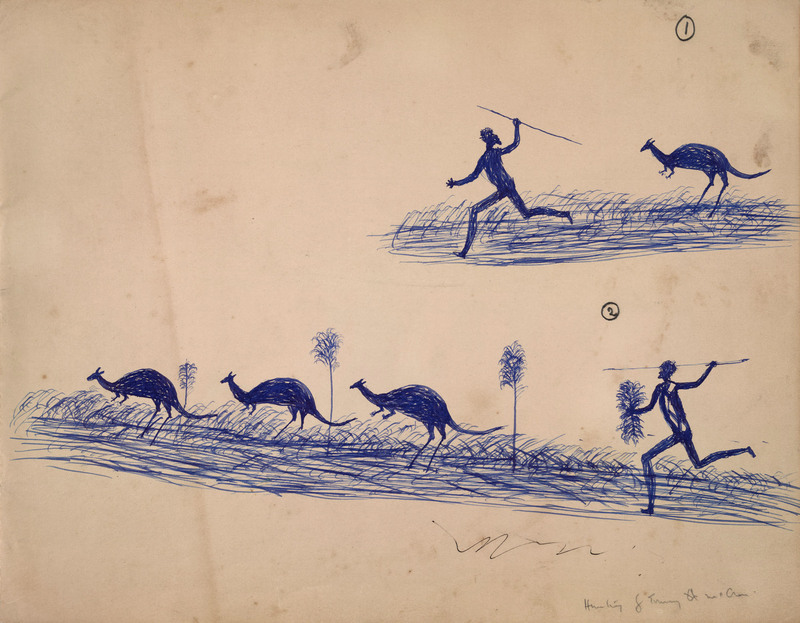 With its pleasant climate, few droughts and floods, and open grassland, which seemed pre-prepared for aspiring pastoralists, Van Diemen’s Land became the preferred destination for immigrants. 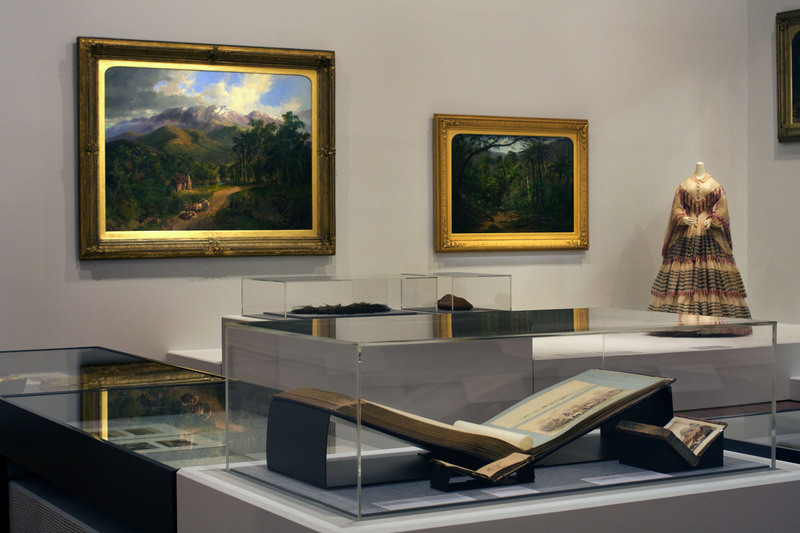 By 1830, almost a third of the arrivals to Australia settled in the south, and the small island experienced economic prosperity. 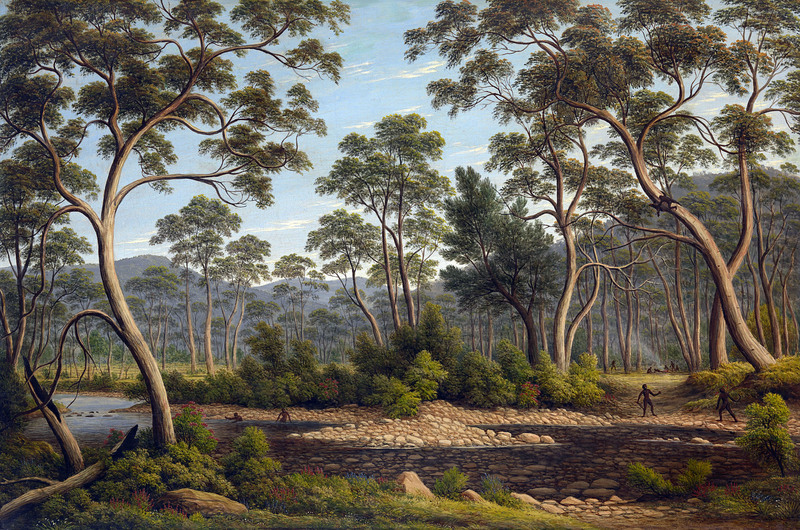 John Glover’s colonial landscapes can be divided into two groups: pastoral scenes of the land surrounding his own property, and pre-contact Aboriginal Arcadias. 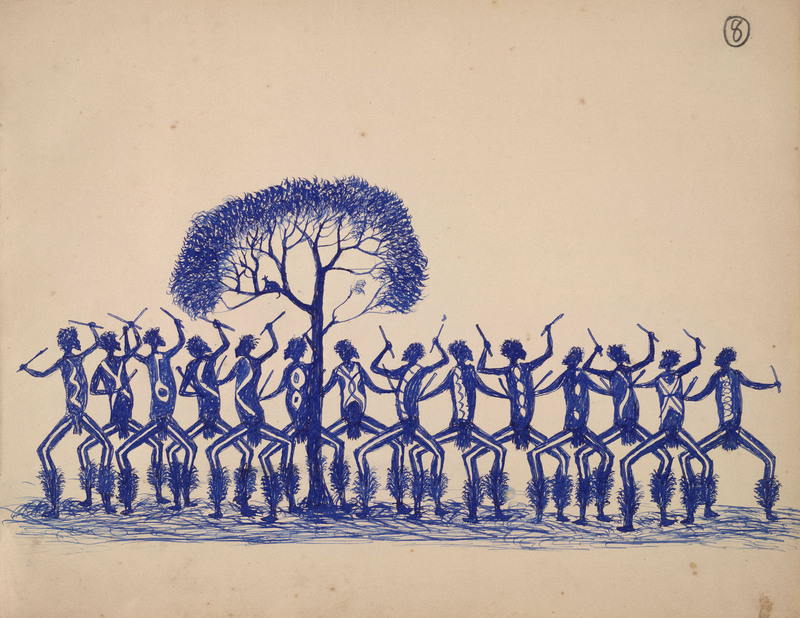 Although the Aboriginal figures are at times generic, they are shown as active participants in the landscape. 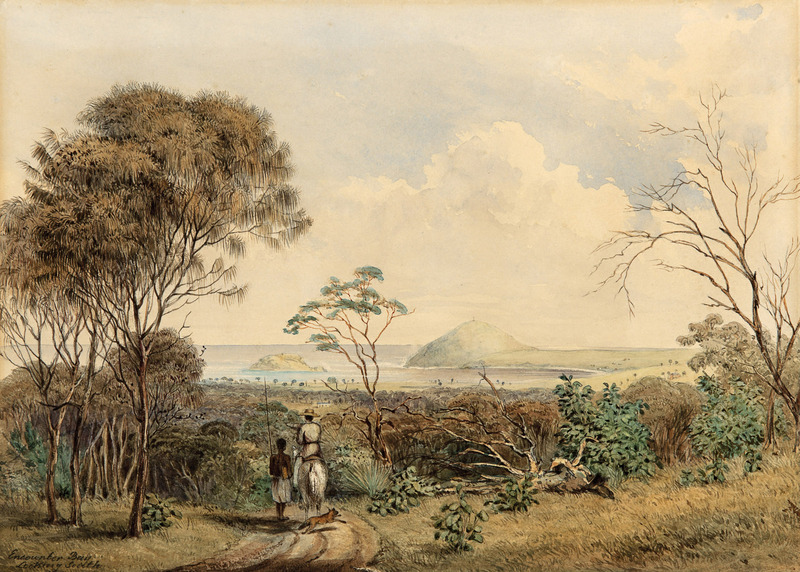 Such scenes were, however, entirely imagined, as Glover encountered very few Tasmanian Aboriginal people while in the colony. 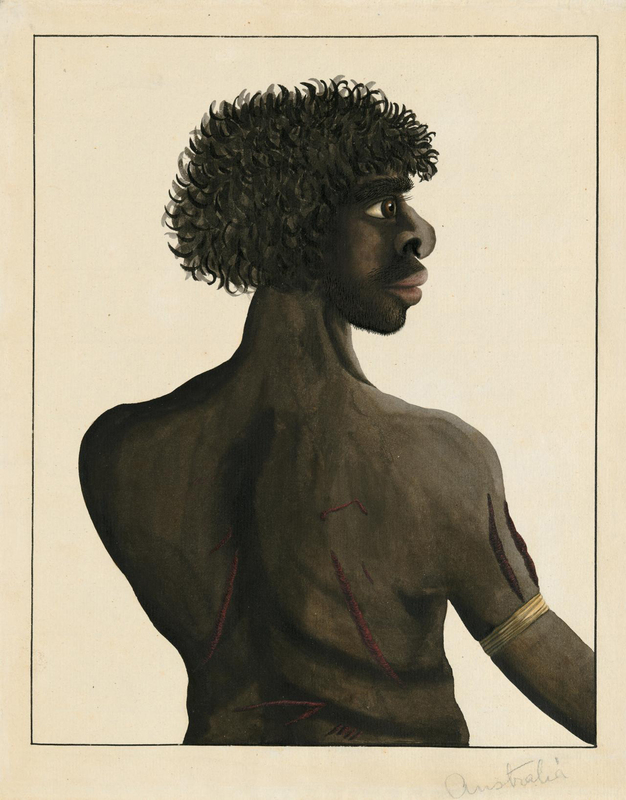 Glover had not experienced the conflict or witnessed the violence between Tasmanian Aboriginal resistance fighters and white settlers during the 1820s. 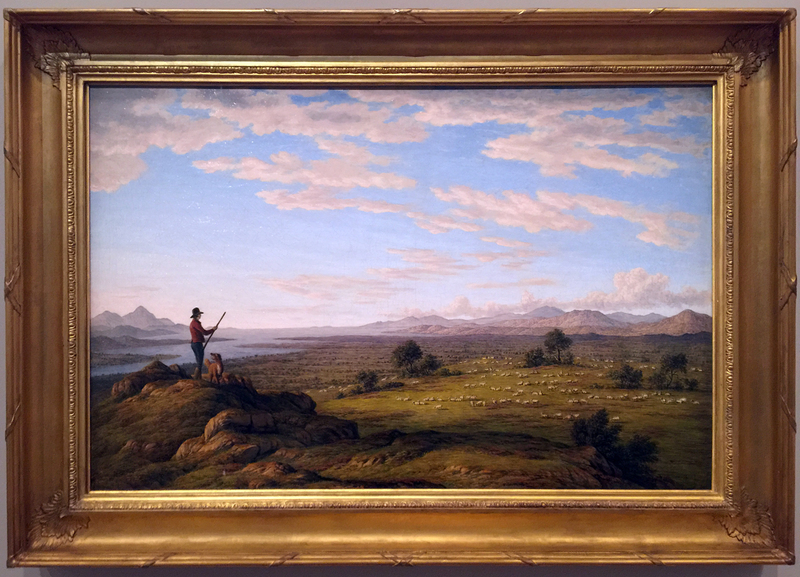 By the time of his arrival in 1831, the Tasmanian Aboriginal survivors had been forced to leave Country and relocate to Flinders Island. 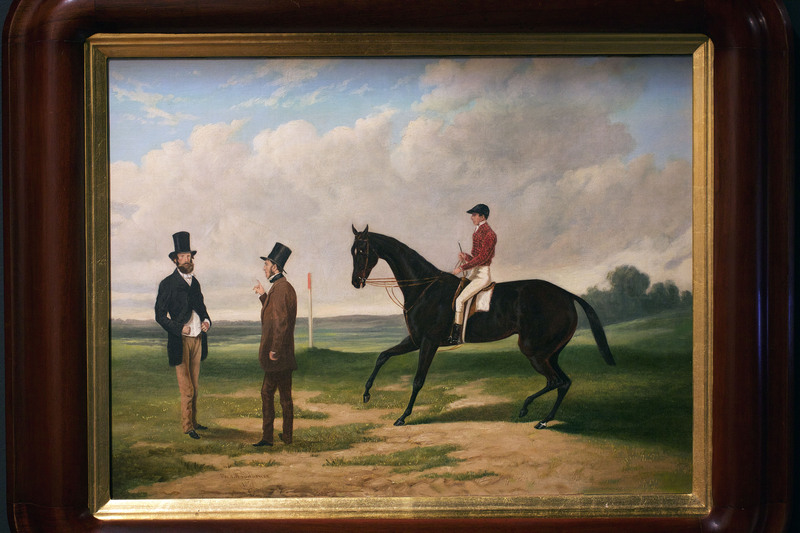 Little is known of the sofa’s provenance before the late 19th century, when it entered the Sonners family of Hamilton – residents of the original Hamilton Inn from 1912 until the 1990s. Its earliest confirmed owner was Albert Sonners (1860 – 1935). 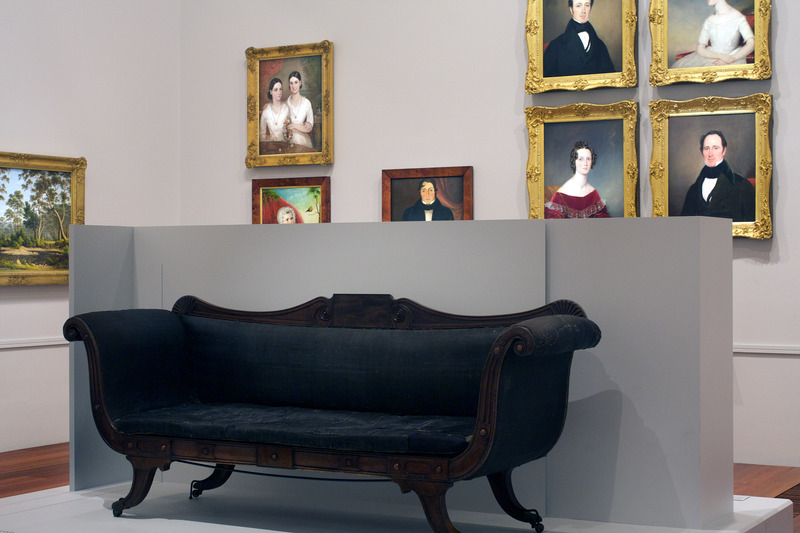 The sofa’s maker, their client and the circumstances of production – including the date of manufacture – remain the subject of ongoing research. However, it appears likely that the sofa was made during the 1820s, when wealthy colonists started to build large houses of the kind implied by the scale of the Hamilton Inn sofa. 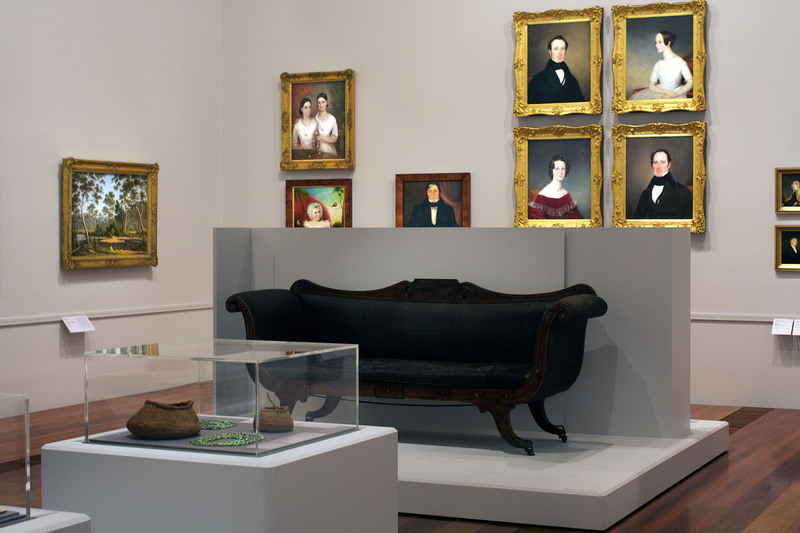 The sofa’s ambitious design would have been the height of fashion in the first decade of the 19th century, and is typical of the then fashionable, Greek-revival style. 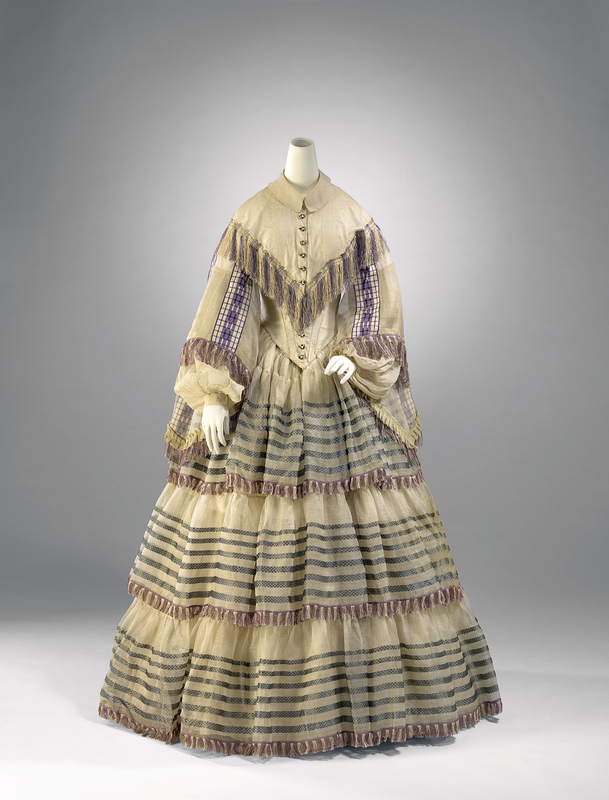 Pattern books became increasingly important as sources of ideas and promulgators of fashions from the late eighteenth century. Thomas Hope’s (1769-1831) Household Furniture and Interior Decoration, published in 1807, was the first to promote the Greek-revival style and may have indirectly influenced the design of the Hamilton Inn sofa. The double-ended sofa – with scrolled arms and ‘sabre’ legs – displays an aesthetic that is restrained and geometric, consisting of shaped and relieved panels, reeding and tablets of decorative veneers. The apparent simplicity emphasises the sofa’s elegant, curved and sweeping profile. Structural components made in Tasmanian hardwoods are disguised by either the upholstery or by cedar panels that also serve to disguise the attaching points for the upholstery. 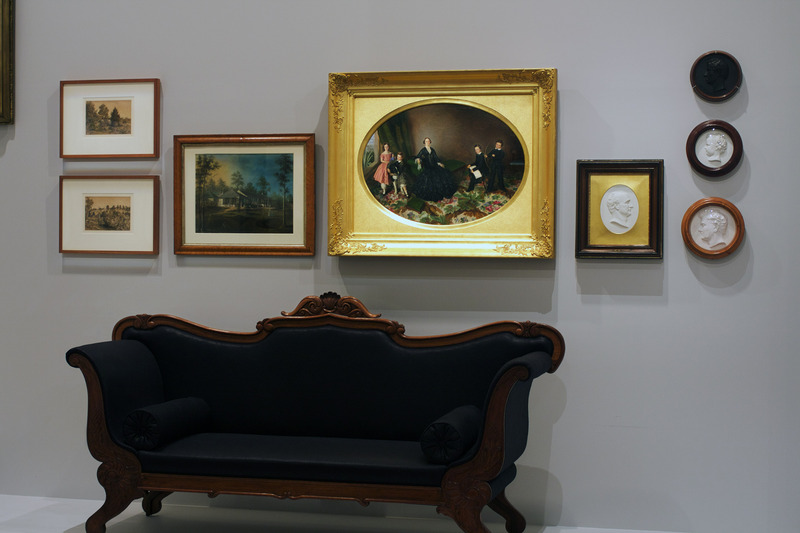 Ultimately, the design and scale of the sofa records the rapid transmission of British fashions to the new island colony, as well as the early presence of highly skilled furniture makers in Tasmania. 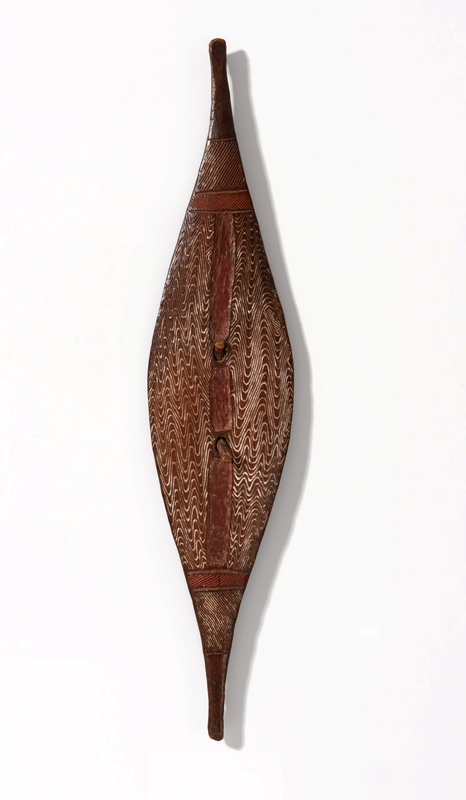 In November 2005, an unrestored red cedar couch discovered in a Tasmanian shed came up for auction in Hobart. The owner of the couch only wanted to make enough money to mend a fence. 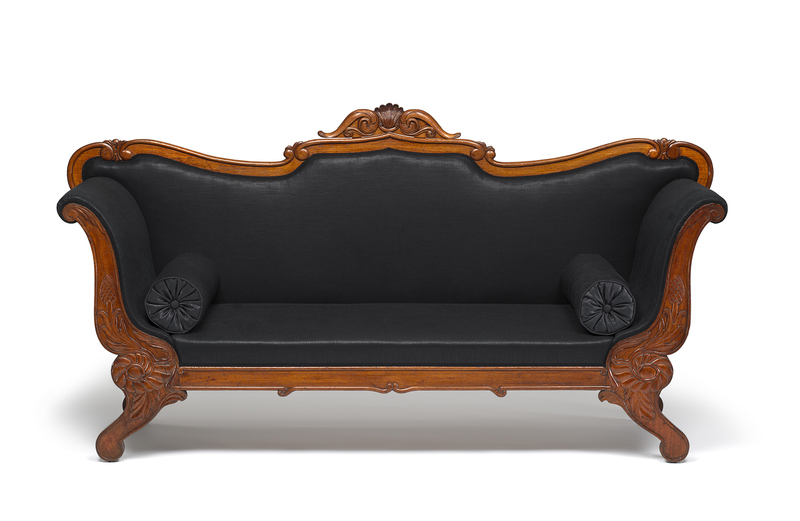 Instead, the couch sold at a drama-fuelled auction for more than $310,000. At the auction, the couch was initially knocked down for $48,000 but a bidder protested and the auctioneer was forced to reopen the bidding. 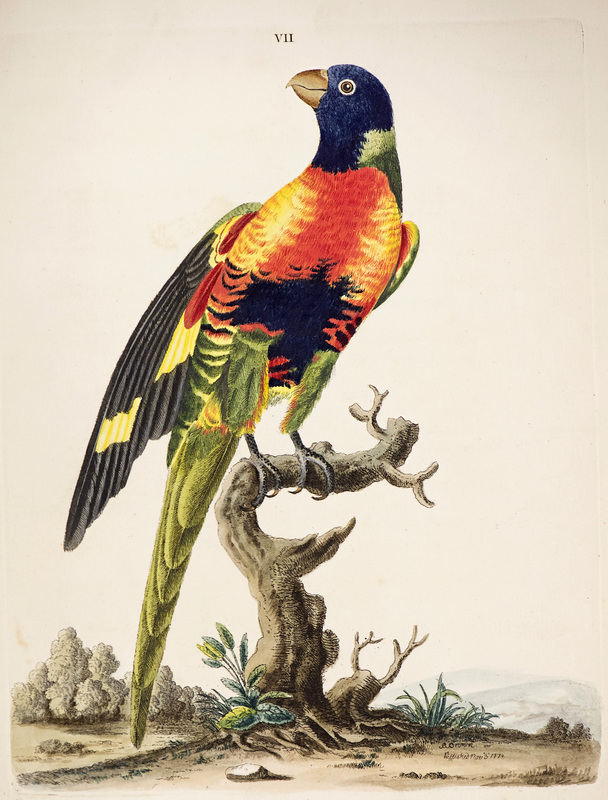 When the new round of bidding finally ceased, the sale was one of the highest prices ever paid for a piece of Australian furniture. When the gallery received the couch it faced a dilemma. The timber finish and upholstery were in poor condition and there was discussion over whether it should be restored or left untouched. After much consultation with experts, it was decided to improve the appearance without compromising the historical significance. “It has the original upholstery, which is very unusual for this age,” says Hughes. 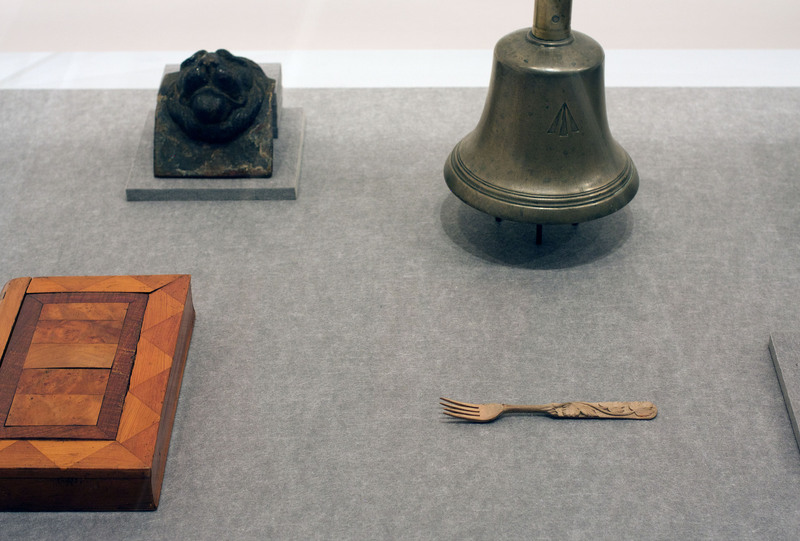 “The finish and the wood are also pretty much original. So this makes it an extremely rare historical document, as well as a fantastic object. 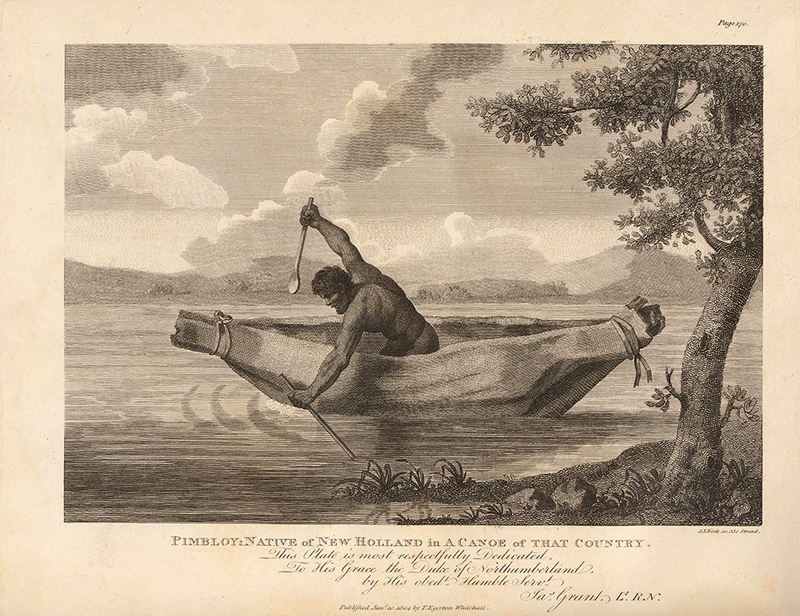 Between the establishment of the settlement of Hobart in 1804 and the early 1820s the British government granted to settlers just over 100,000 acres of land already occupied by Tasmanian Aboriginal people. By the beginning of the 1830s more than fourteen times this acreage had been taken over by Europeans. 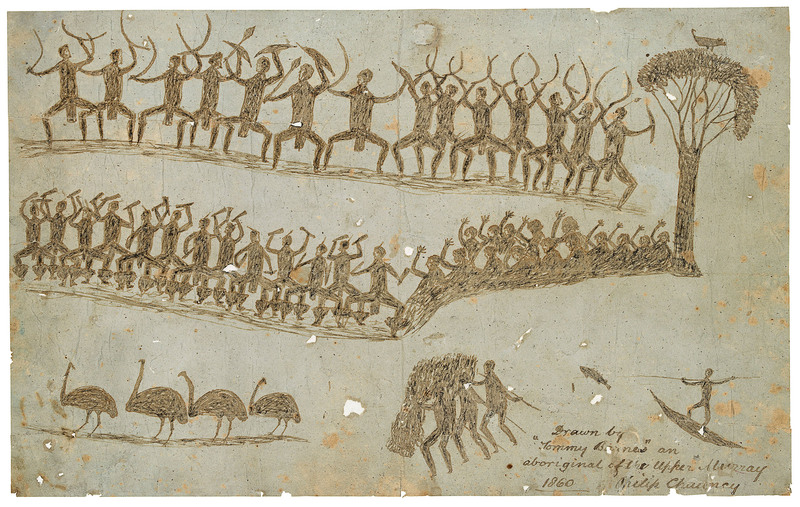 During these decades, Tasmanian Aboriginal communities were ravaged by introduced diseases and famine as their hunting grounds disappeared, and were involved in violent clashes with the settler population. 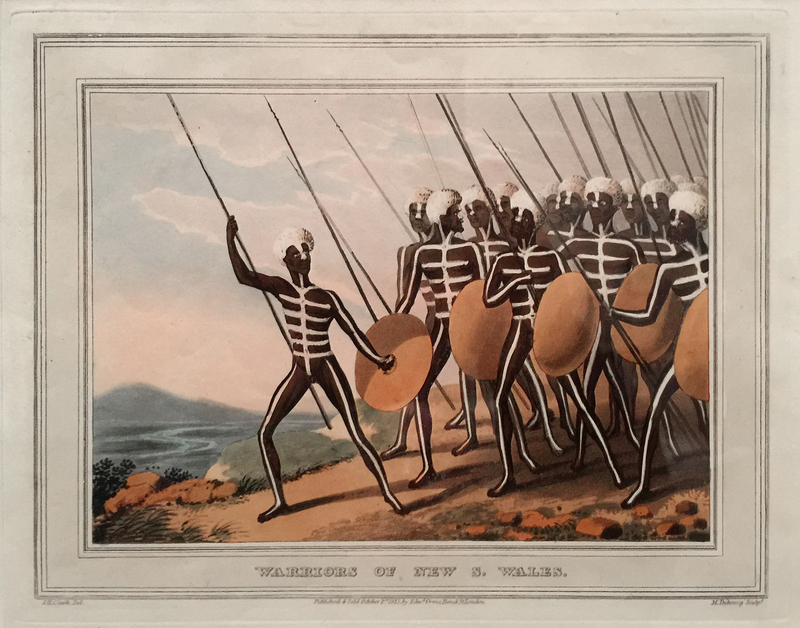 These conflicts escalated during the 1820s and came to be known as the Black War. 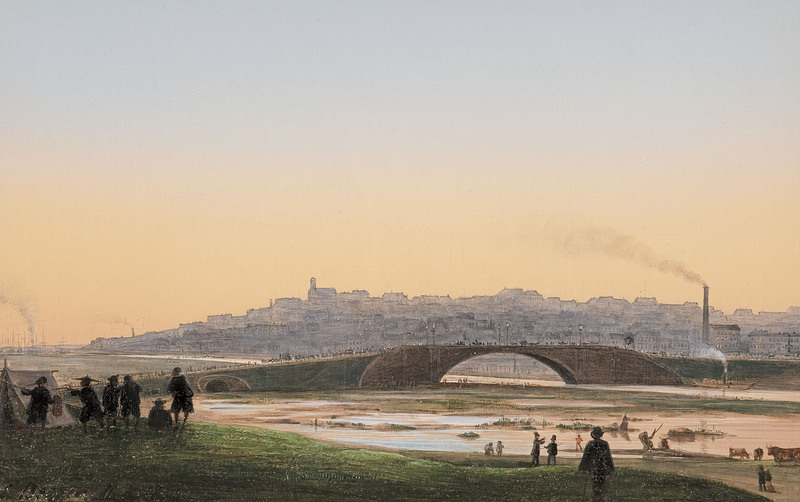 In 1835, Melbourne was established on the Country of the Kulin nation on the northern bank of Birrarung, the ‘river of mists and shadows’. 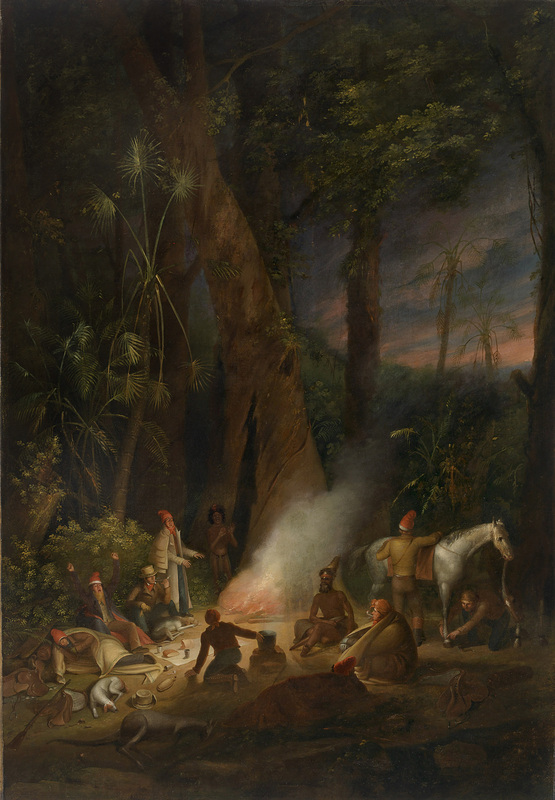 Contact between Indigenous peoples and European explorers and raiding groups of sealers had begun prior to the arrival of hopeful colonists from Van Diemen’s Land. They were soon followed by John Pascoe Fawkner and John Batman, each leading separate parties of settlers keen to secure acreage on the fertile lands found in what was soon to be known as the Port Phillip District. 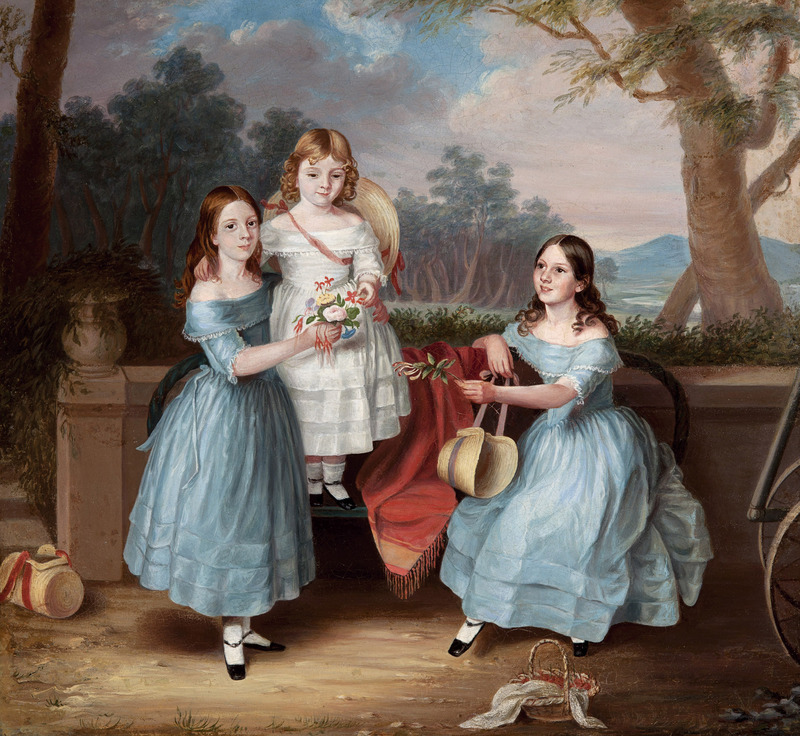 In the late 1830s the young brothers Jeremiah, Joseph and John Ware, the eldest just twenty years of age, had played a major role in the settlement of the Western District in Victoria. 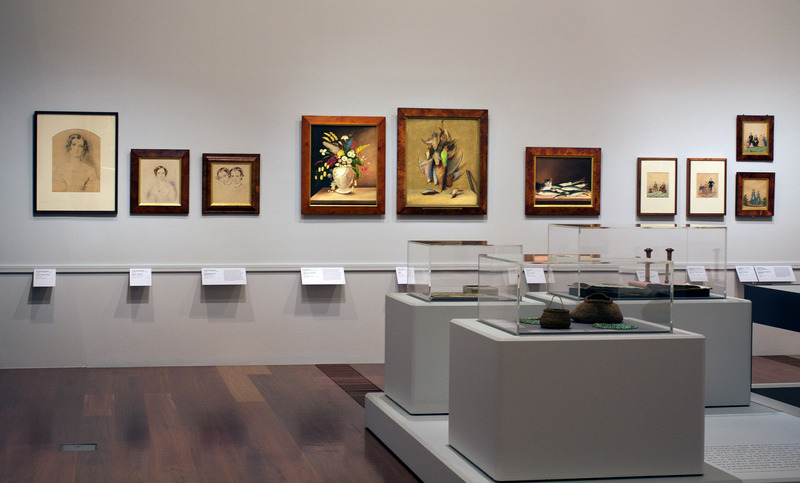 By 1856 they were established and notable figures in the colony and had become significant patrons of the fine arts. 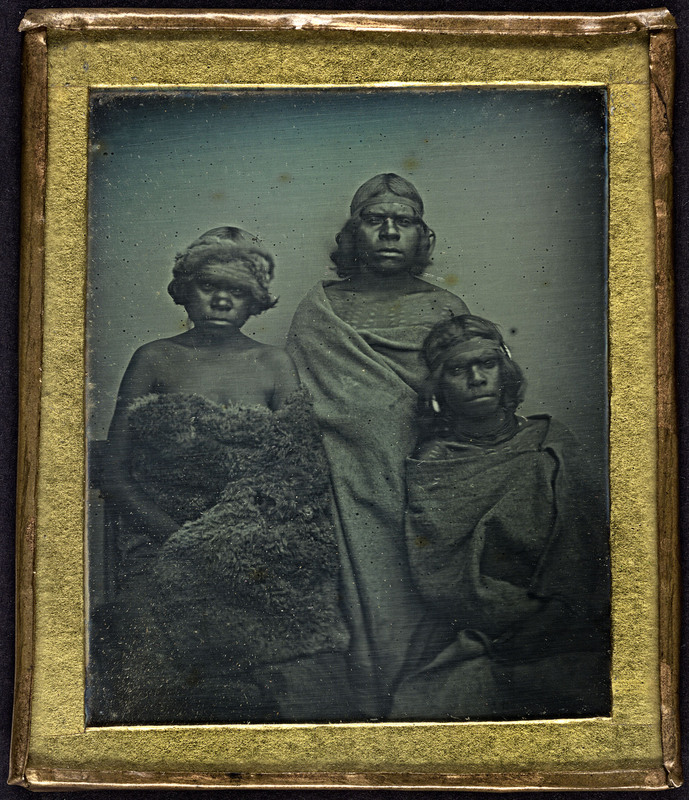 Robert Dowling’s family portrait Masters George, William, and Miss Harriet Ware and the Aborigine Jamie Ware is set in the grounds of pastoralist Joseph Ware’s property, Minjah. The group is headed by the eldest son, George, who bears a staff, the Biblical symbol of leadership often associated with Moses. 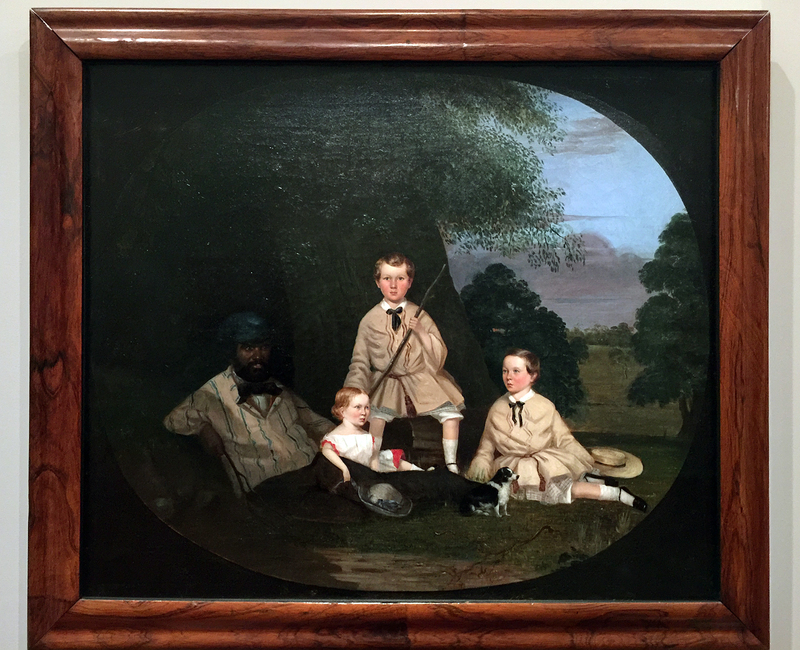 To the right sits his younger brother, William, on the left is their sister Harriet and the Mopor youth from Spring Creek who took the family name, Jamie Ware. 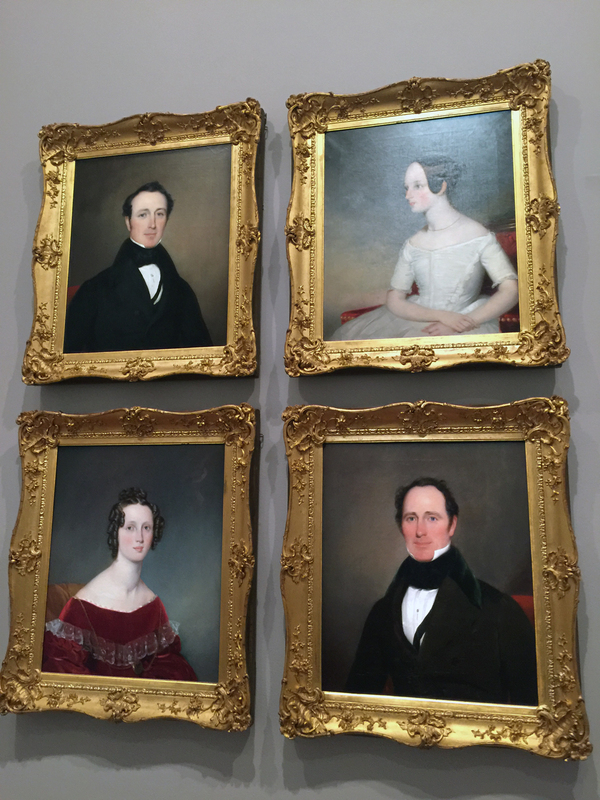 The portrait has remained with the descendants of the Ware family since its commission and is a poignant depiction of interracial accord. 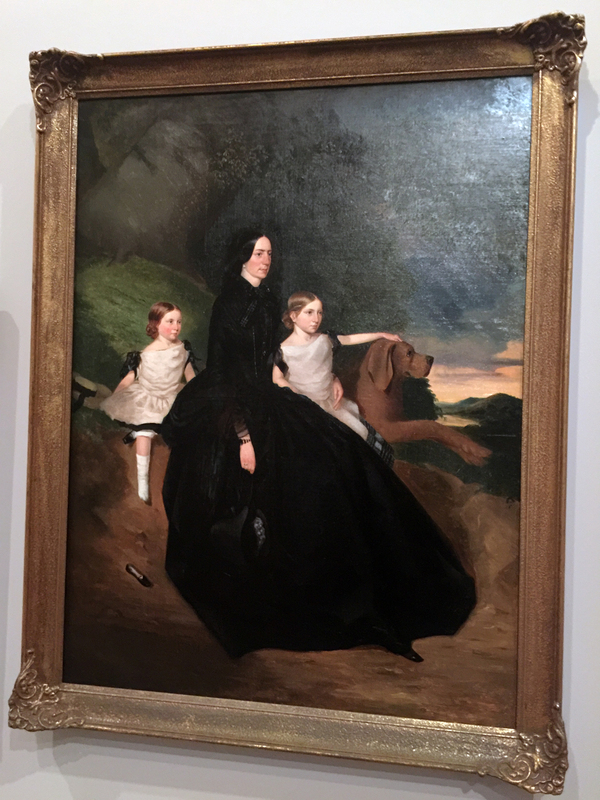 There is an obvious affection between Jamie and Harriet: he reclines comfortably while the young girl drapes her arm casually over his leg. 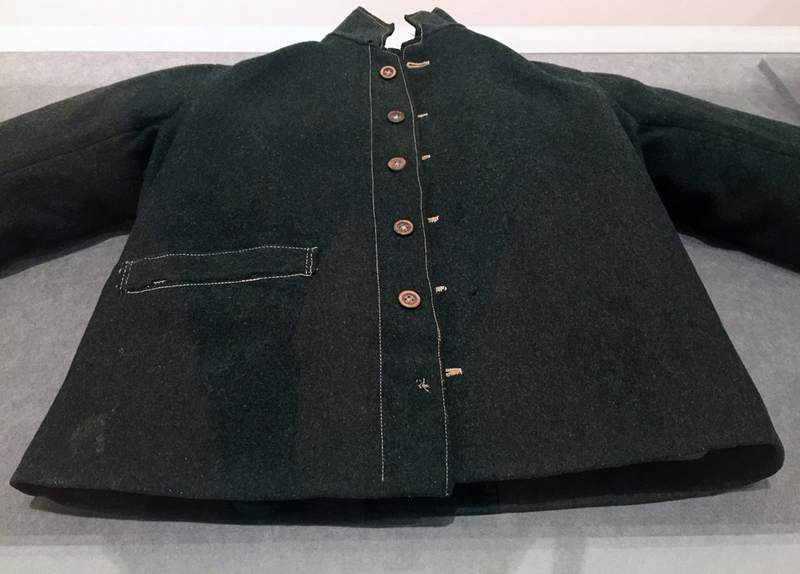 The absence of Jamie’s employers – the children’s parents, John and Barbara Ware, gives added resonance to the work, revealing the trust and intimate position Jamie held in the family. 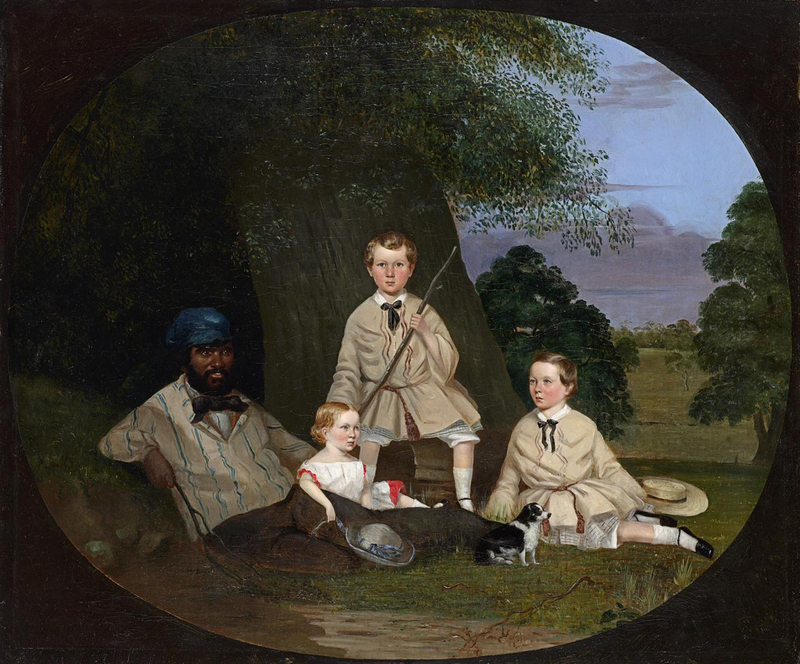 The depiction of the youth in European dress rather than as an anthropological study expresses the family’s concern for harmonious relations with Indigenous people. 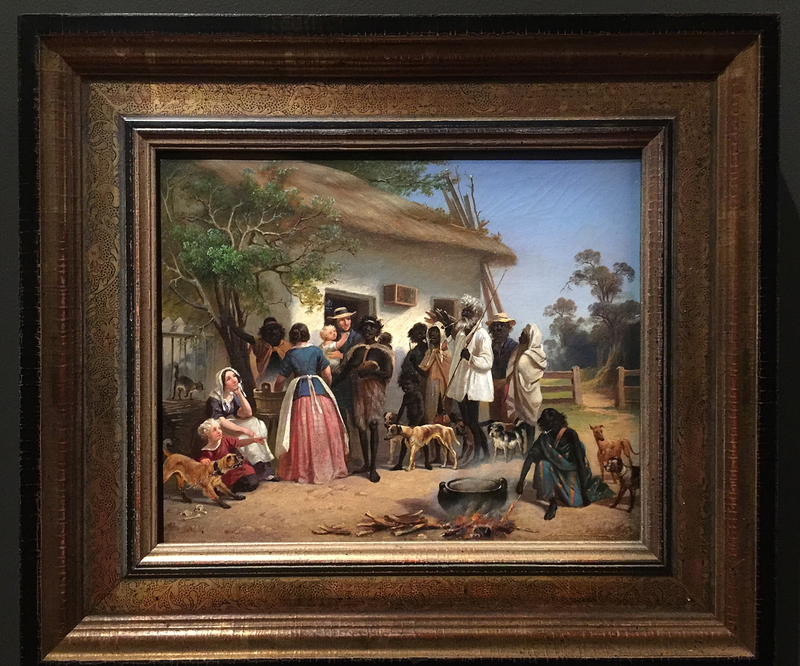 Jamie’s inclusion is also symbolic of the Ware family’s awareness of the traumatic post-contact history experienced by Indigenous Australians, an understanding that was not generally shared in mid-nineteenth-century Victoria. 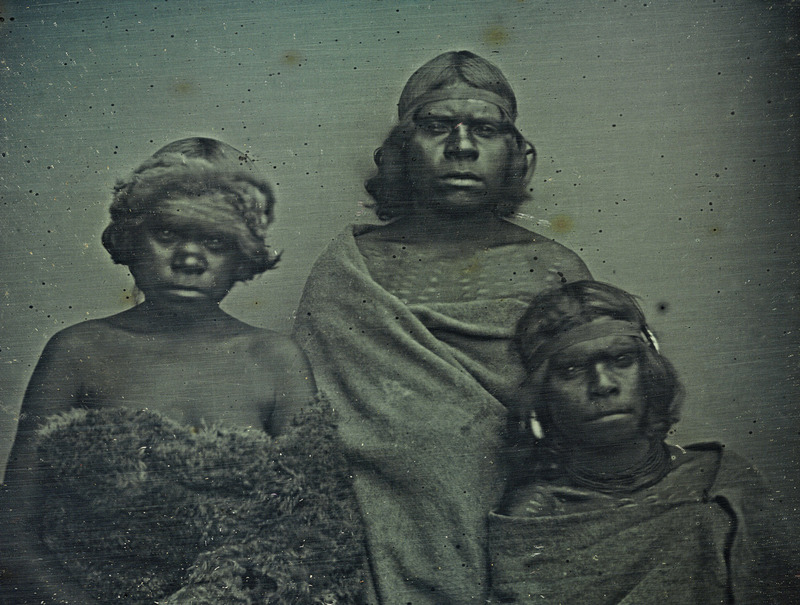 By the 1850s it was reported that Tasmania’s Indigenous population had been decimated, which would have been a significant issue for Dowling and the Wares who had all migrated from the southern-most colony. 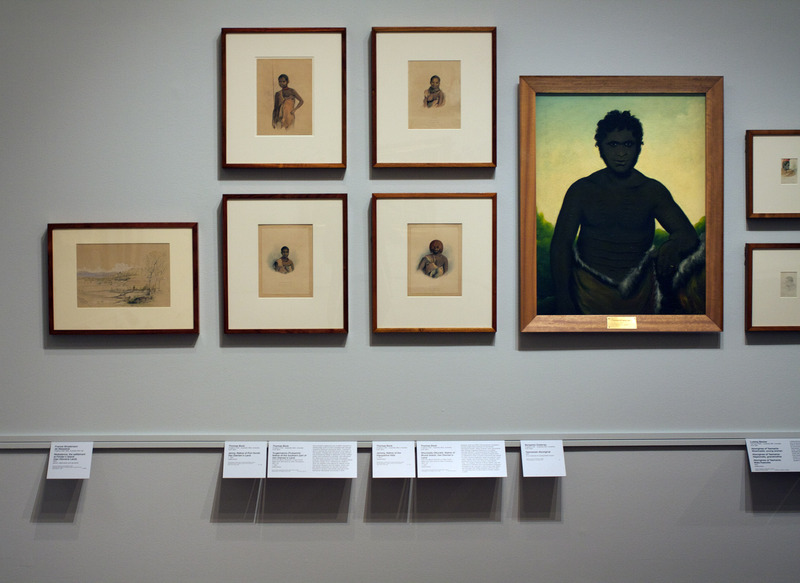 Dowling painted a number of works that were intended as memorials, such as the NGV’s Tasmanian Aborigines, 1856, and Warrnambool Art Gallery’s Minjah in the old time, 1856. 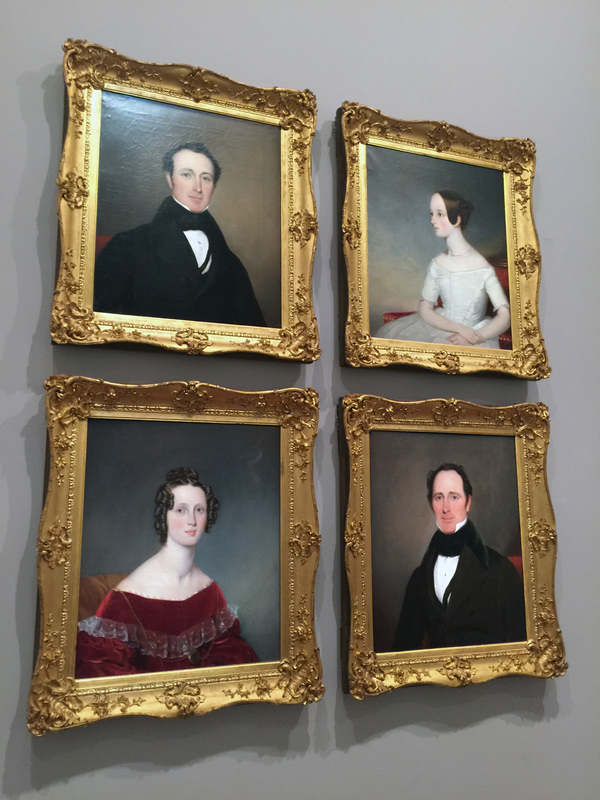 While these works look to the past and convey a sense of mourning, the Ware family portrait looks positively towards a more harmonious future and therefore is a transformative work to enter the NGV’s nineteenth-century Australian collection. 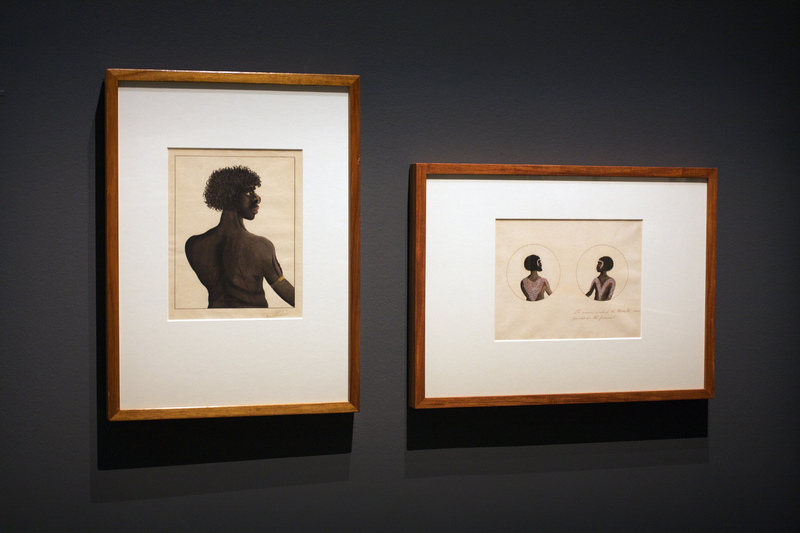 Masters George, William, and Miss Harriet Ware and the Aborigine Jamie Ware joins a number of works in the NGV collection that share a Ware family provenance. 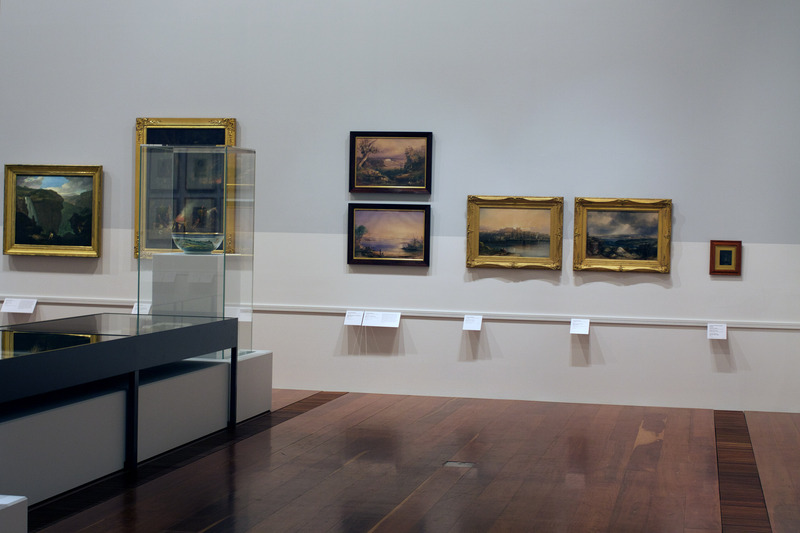 Joseph Ware commissioned six works from Dowling between 1855 and 1856, and the NGV collection contains works acquired by his younger brother, John Ware, that were donated in 2004 as part of the Joseph Brown Collection. 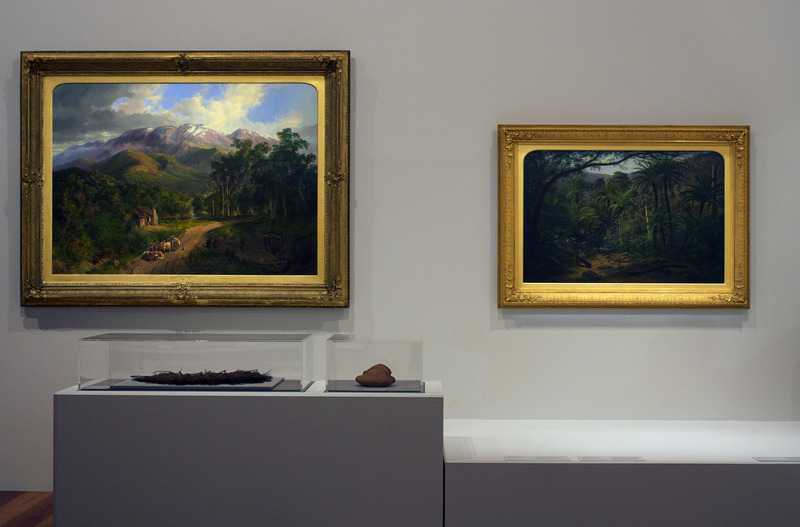 These include Eugène von Guérard’s Spring in the valley of the Mitta Mitta with the Bogong Ranges in the distance, 1863, and the homestead portrait of John Ware’s Yalla-y-Poora, 1864. Dowling continued to receive Ware family patronage after he left Australia in 1857; his portrait Miss Annie Ware, 1882, the daughter of John Ware, being commissioned during the sitter’s European travels. 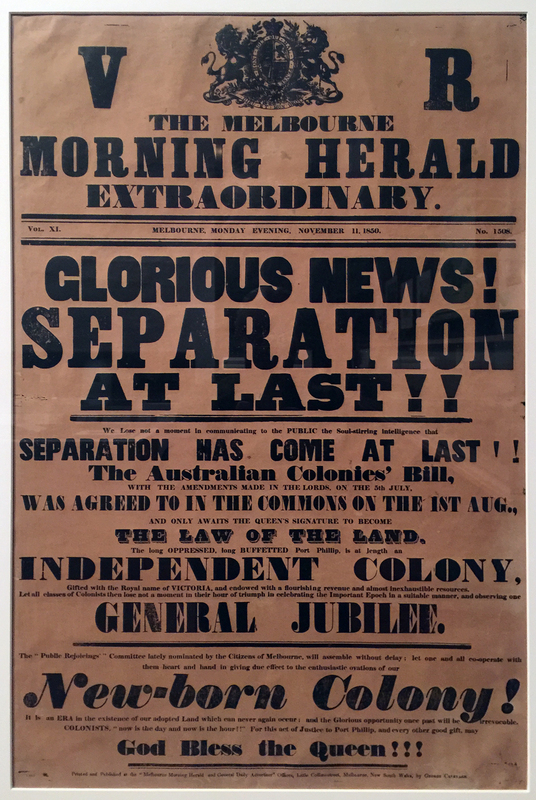 As early as 1829 the development of a convict‑free colony, home to settlers and migrants from Britain, was mooted. Seven years later, with regal approval, the Province of South Australia was officially proclaimed. 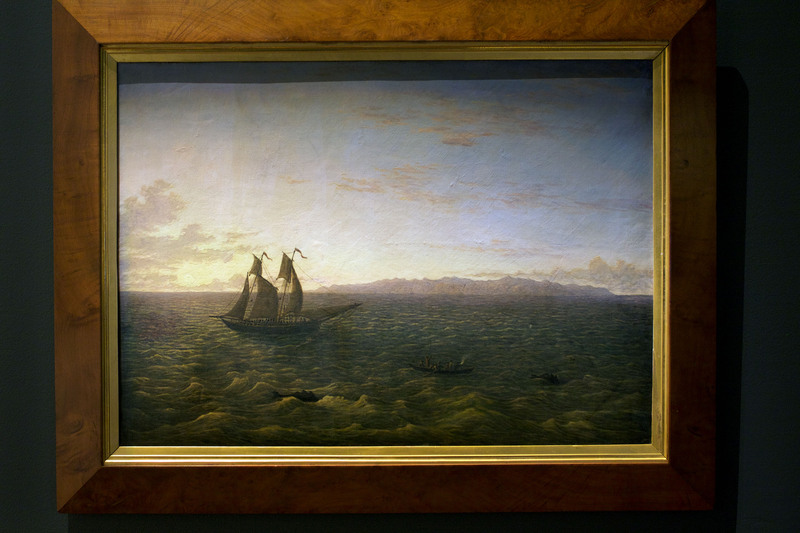 Nine ships carrying free settlers to the colony set sail from England in 1836. 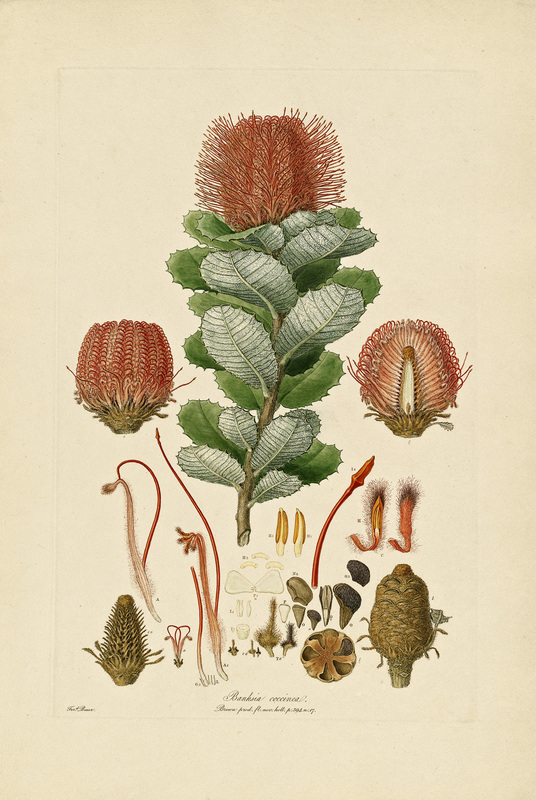 They landed at Kangaroo Island and Holdfast Bay and finally settled on the banks of the Torrens River, where the township of Adelaide was established. 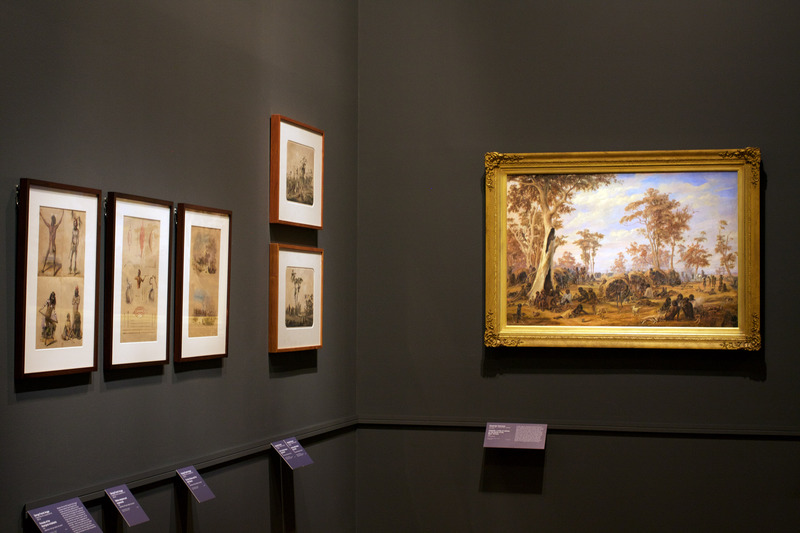 With a number of trained artists among the early colonists, South Australia rapidly secured a position comparable to that of Hobart as a sophisticated centre for the visual arts. 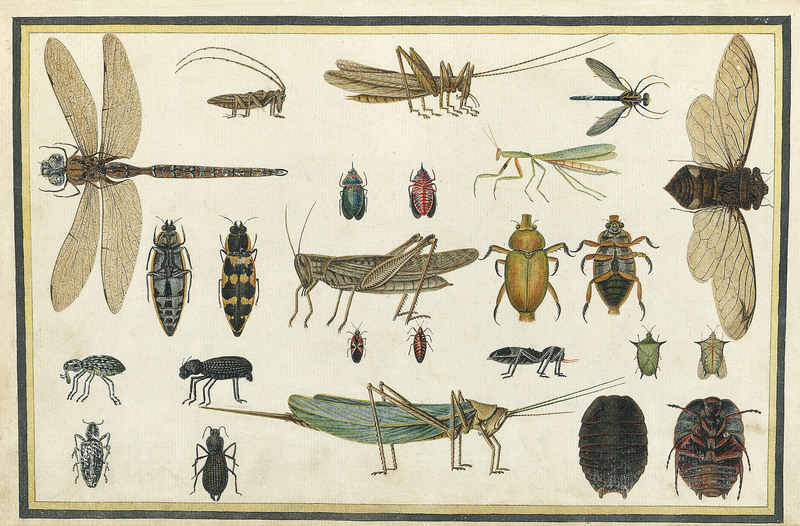 These artists documented the earliest years of the colony and the first settlers. 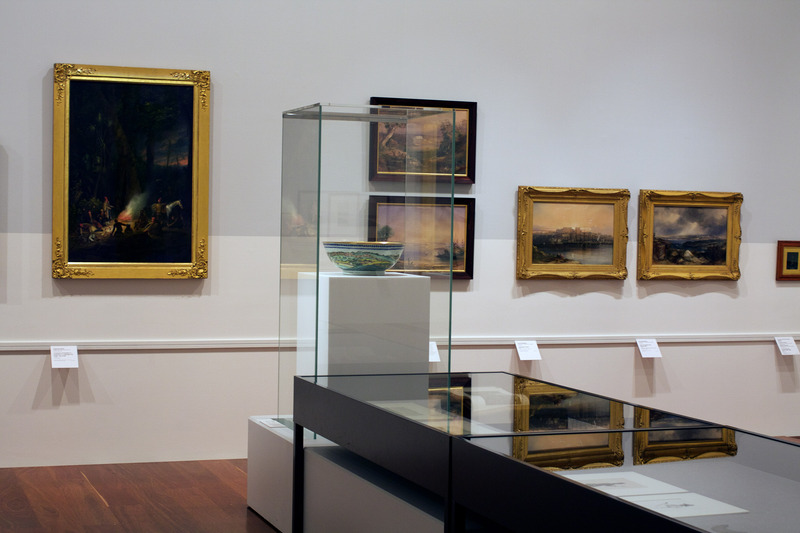 In 1845, Australia’s first solo exhibition was held by George French Angas, and two years later Adelaide artists held a group exhibition in the new colony. 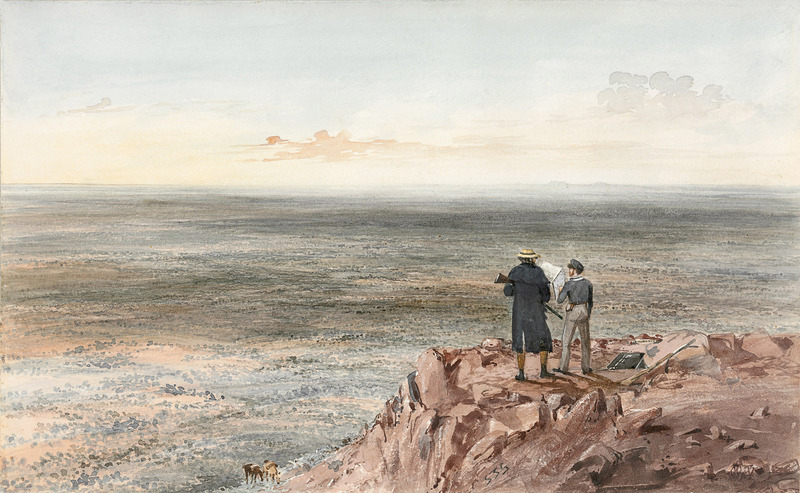 The discovery of gold in Victoria led to an exodus to the eastern colonies, slowing but not halting activity in South Australia. 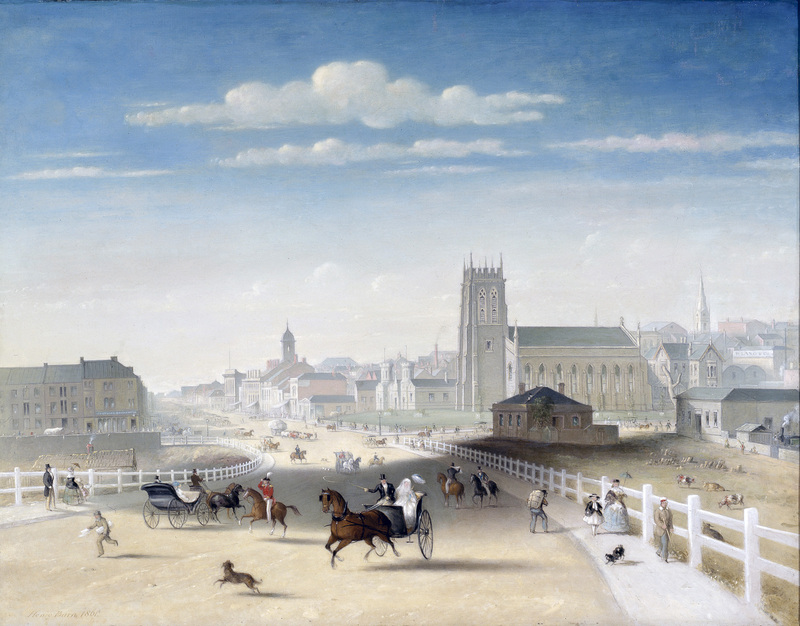 The township of Melbourne grew steadily as migrants from Britain and other European countries sought economic opportunities and political and religious freedom. 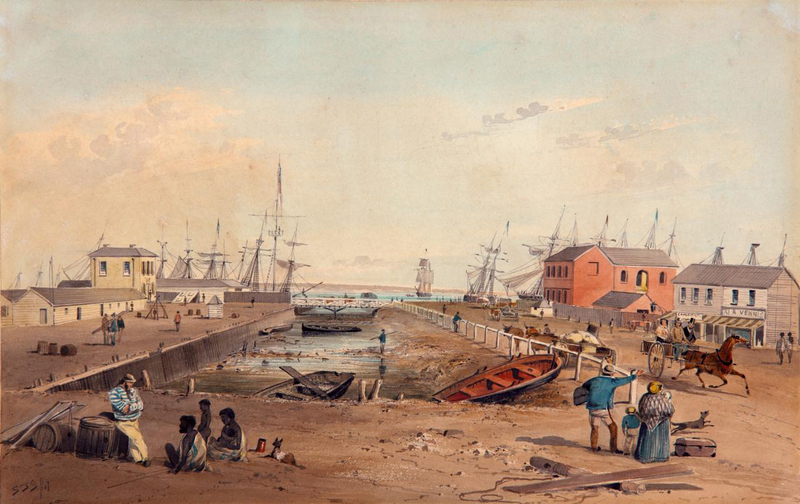 In 1851, the Port Phillip District became an independent colony and was named Victoria in honour of the Queen. The town’s fortunes were further transformed that year when gold was discovered. Victoria was the richest source of gold in Australia, and consequently experienced the greatest levels of growth and change. The population exploded as enthusiastic and optimistic prospectors poured in from around the world with the hope of making their fortunes. 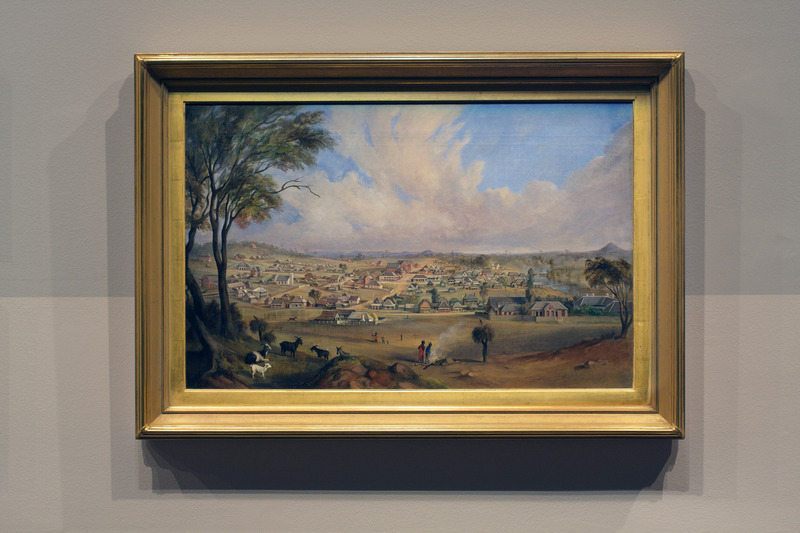 Despite enormous social turmoil and environmental destruction, gold propelled Melbourne into an unprecedented phase of expansion and prosperity.